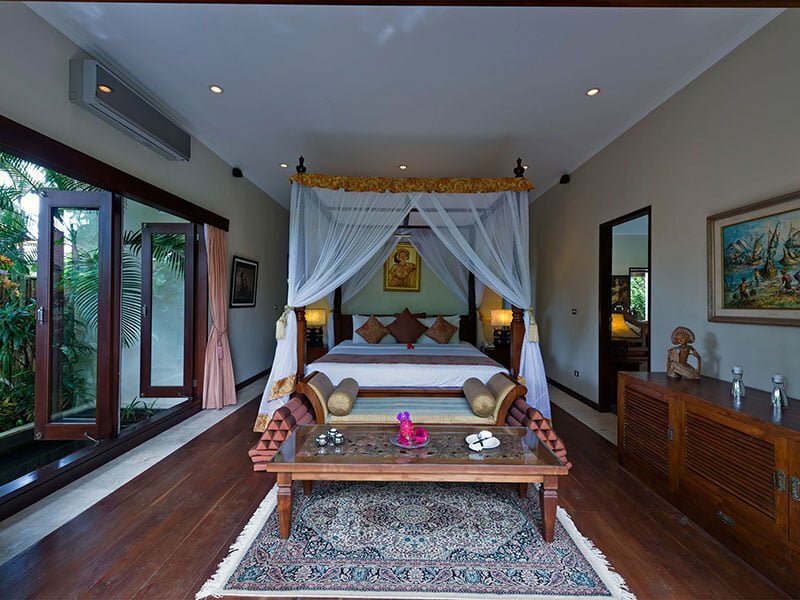 Guests seeking to treat their loved ones with a true oasis of luxury accommodation, then they had better book a bedroom in our villa. 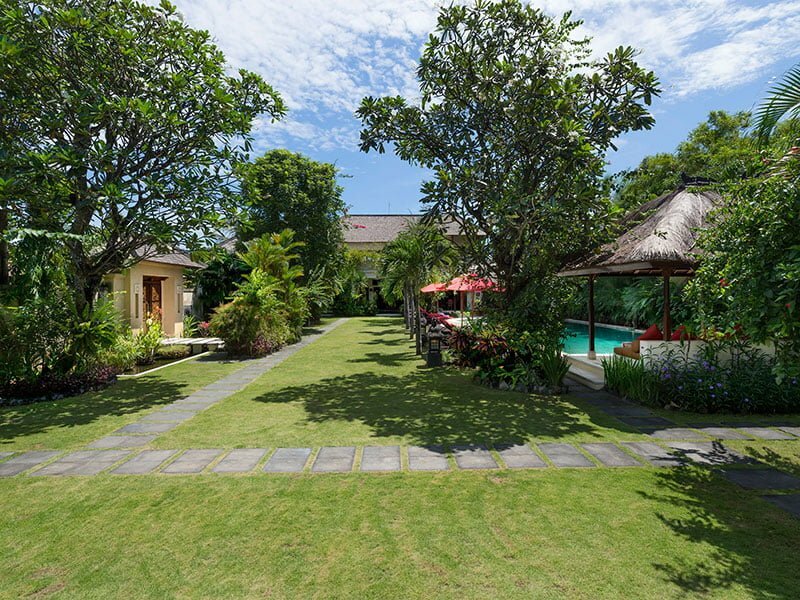 Villa Kalimaya i is a stately haven offering a rental option for four or five magnificently appointed bedrooms. 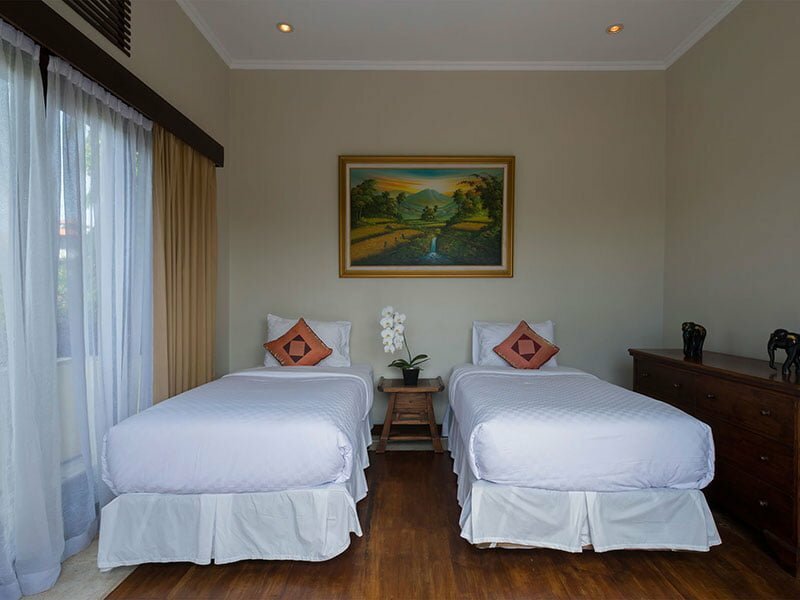 With plentiful ample spaces, our facility is an ideal spot for families or group of friends looking for a perfect getaway to unwind and relax. 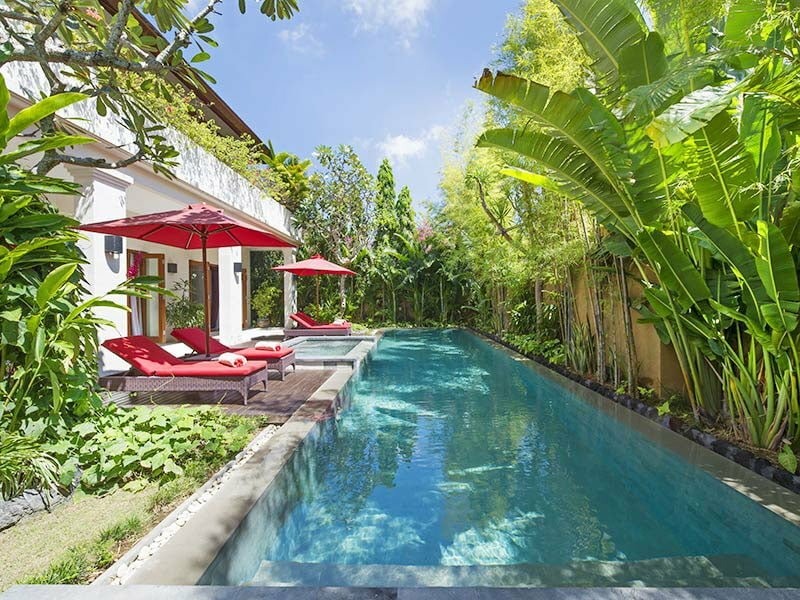 This villa is set within the heart of the bustling Seminyak, and it is a few-stroll away from some of the iconic and best-known bars and restaurants on the island. 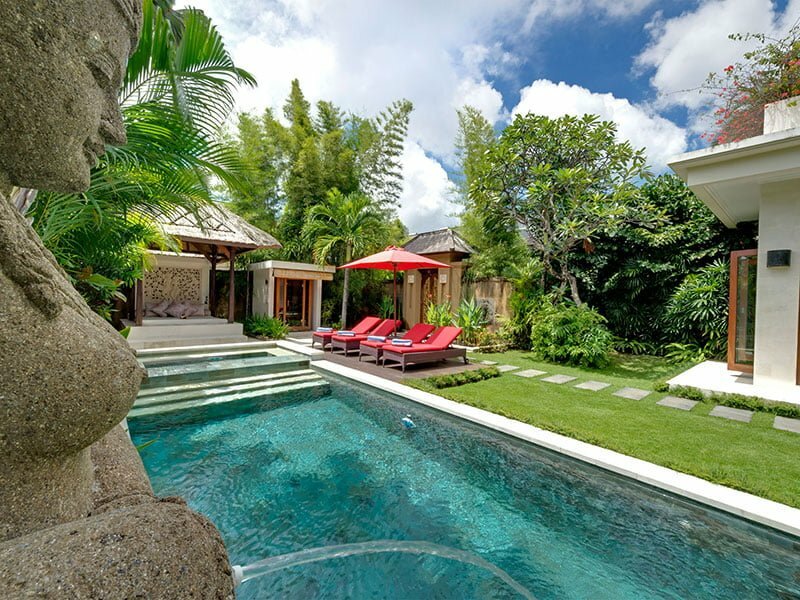 Villa Kalimaya I discreetly sit on a tropical garden and the time you pass through the 24/7-guarded wooden door gates and cross the bridge atop the koi pond you will instantly feel that you are several miles away from the bustle and hustle of the outside world. 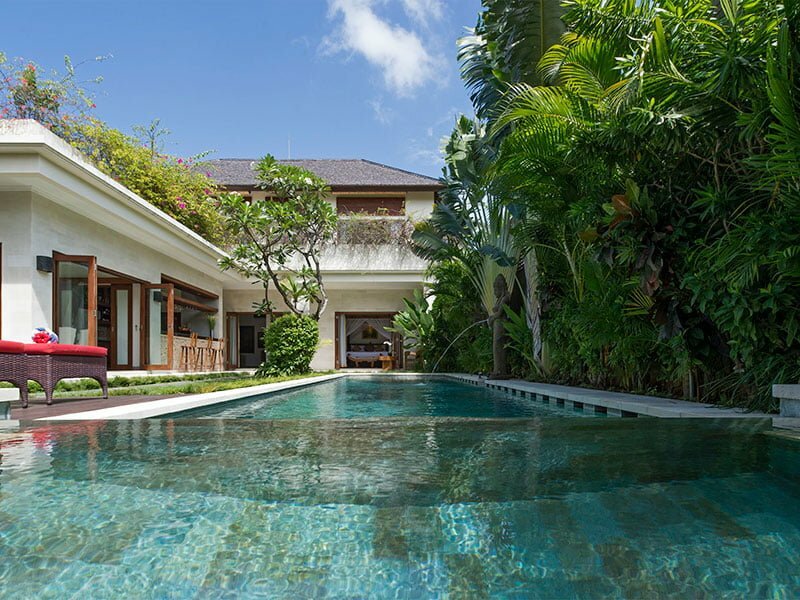 Surrounding the villa’s wall are tall palm trees, brightly colored bougainvillea, and fragrant frangipani trees, the only sounds reaching your ears are chirping of birds and relaxing splashes of water fountains. 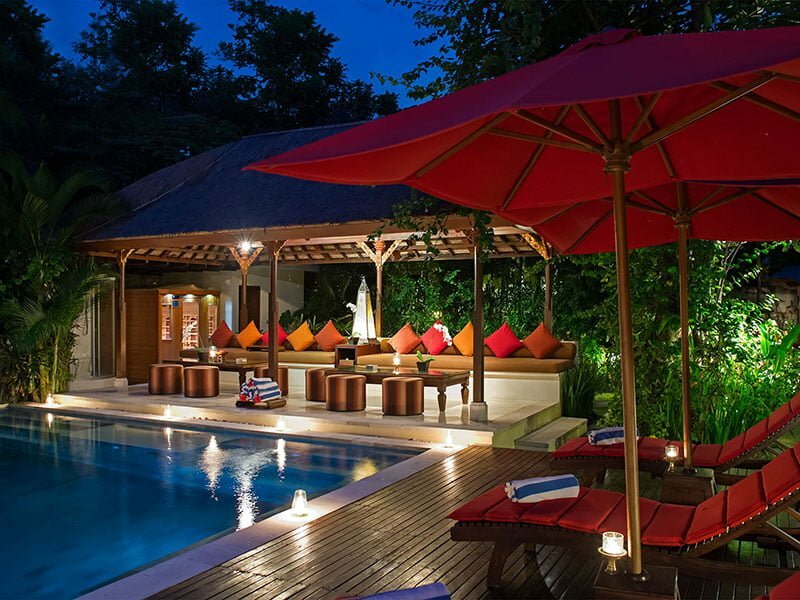 That is not enough though; welcome to the pool area so you can know why our villa breathes a luxury vibe. 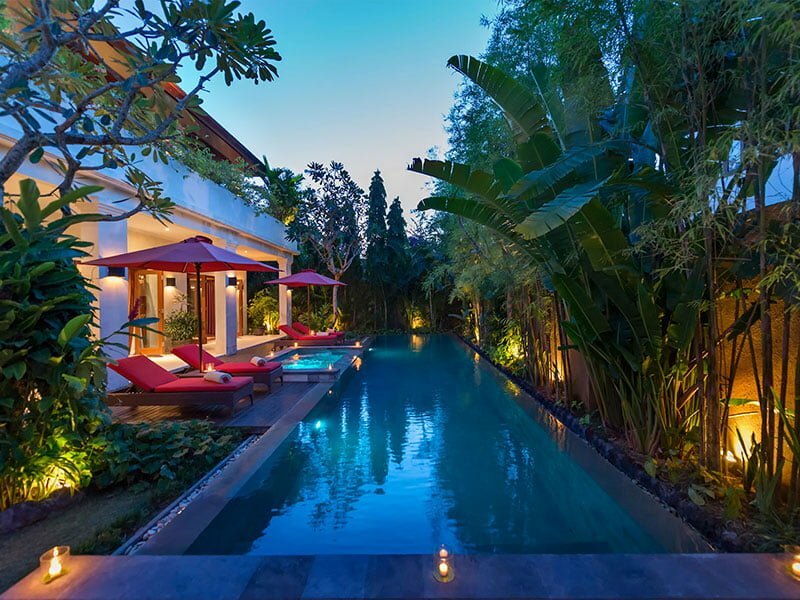 The 18 by 8-meter pool invites everyone to experience a dip of cool clear blue-sky waters. 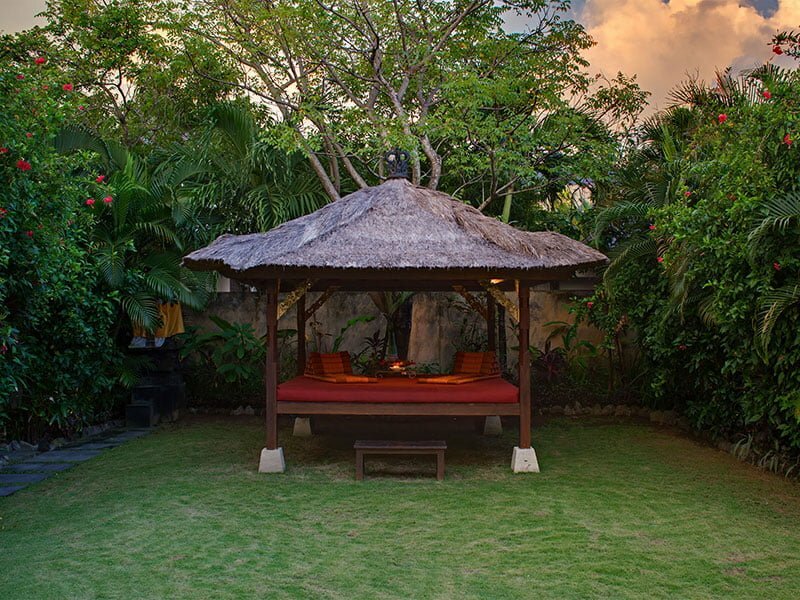 For a perfect relaxation after the dip, choose one of the comfy loungers alongside the pool deck and soak up under the sun or indulge in Balinese massages. 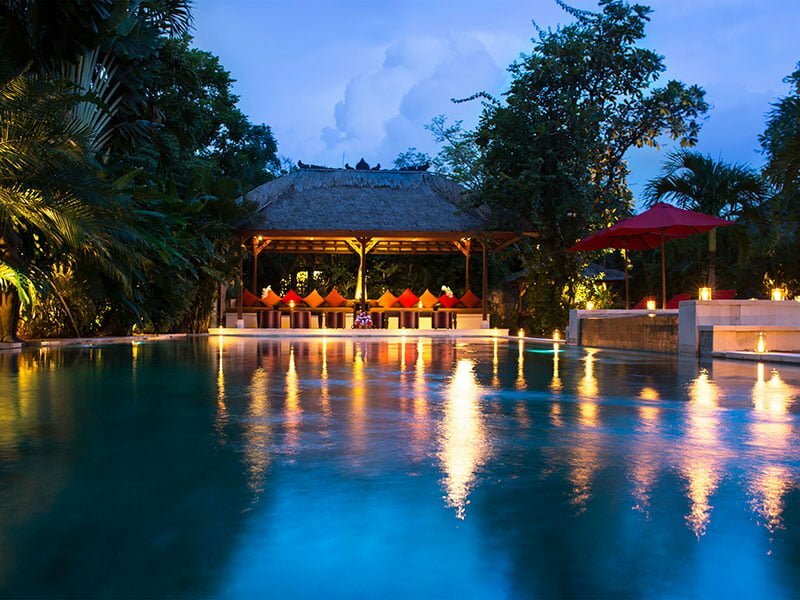 If that does not impress you, then head over to the poolside bale –an ultimate spot for lazing around during hot and sunny afternoons. Our main living area is nestled on the ground floor. 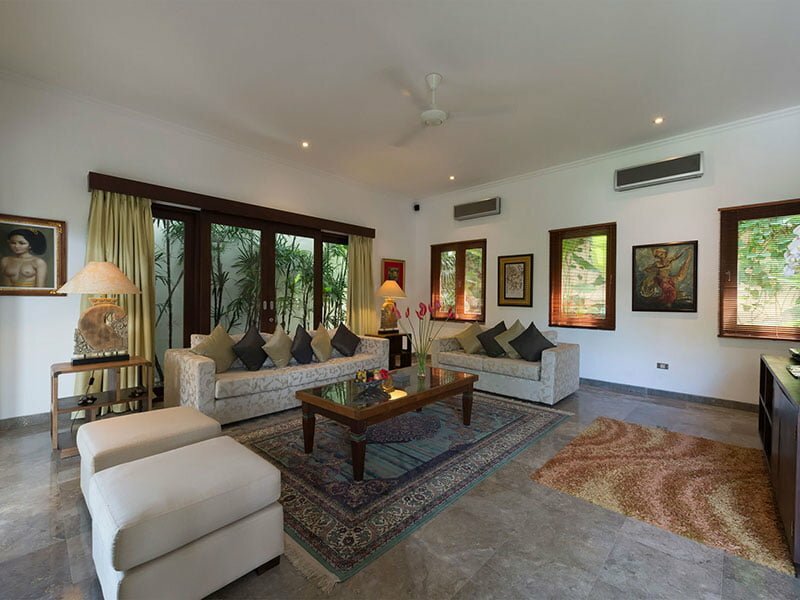 This is an open-plan space with large sliding glass doors and windows that open up to the villa’s pool and the garden. 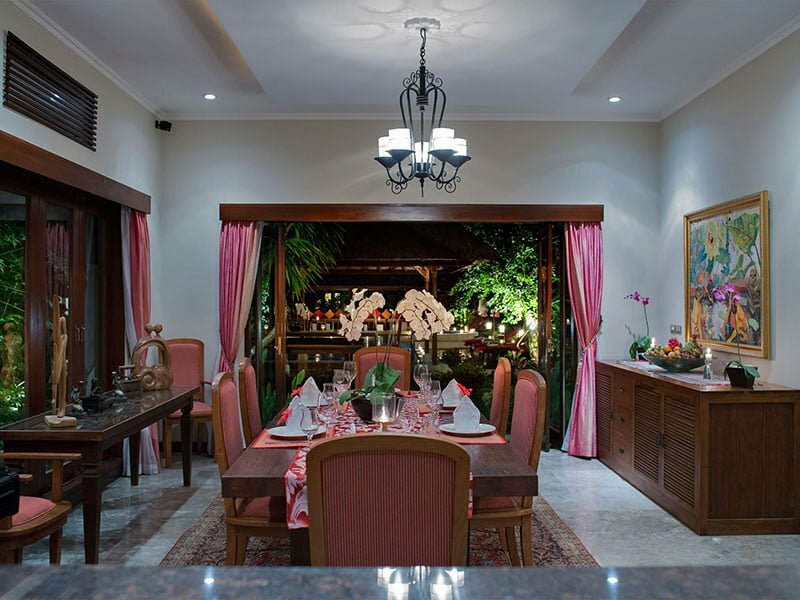 Inside the main pavilion are well-furnished kitchen area and dining room with a seating for up to ten people. For ultimate entertainment, guests are advised to take a few flight steps to reach the upper floor, which is furnished with modern entertainment set including television, DVD player, and free Wi-Fi internet. 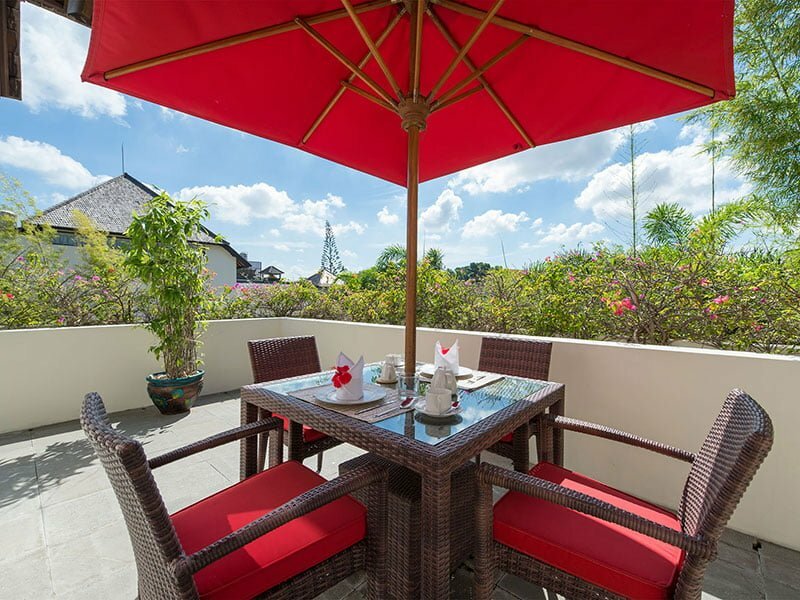 This latter place is also a perfect spot to enjoy an alfresco dinner or lunch with family and friends. 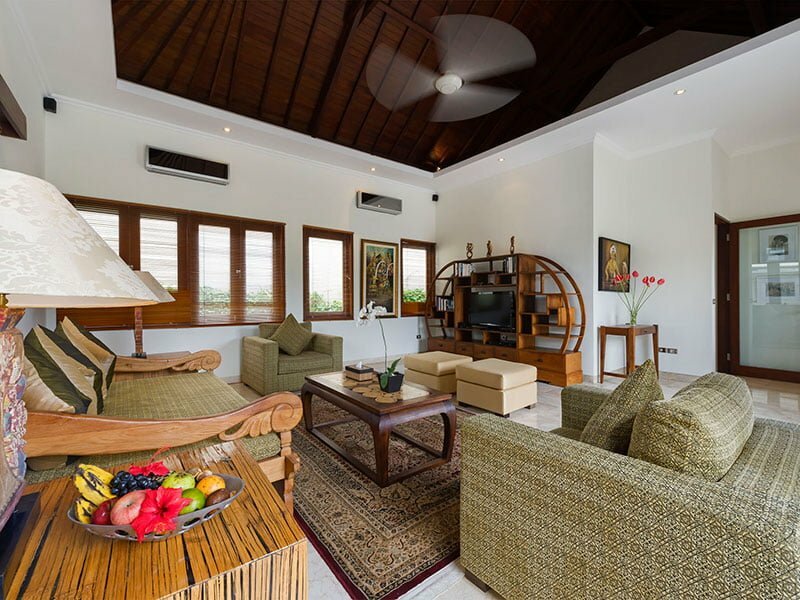 Our Villa Kalimaya i is a spacious and well-appointed five-bedroom facility complete a safe, bar bridge, DVD players, and satellite televisions. 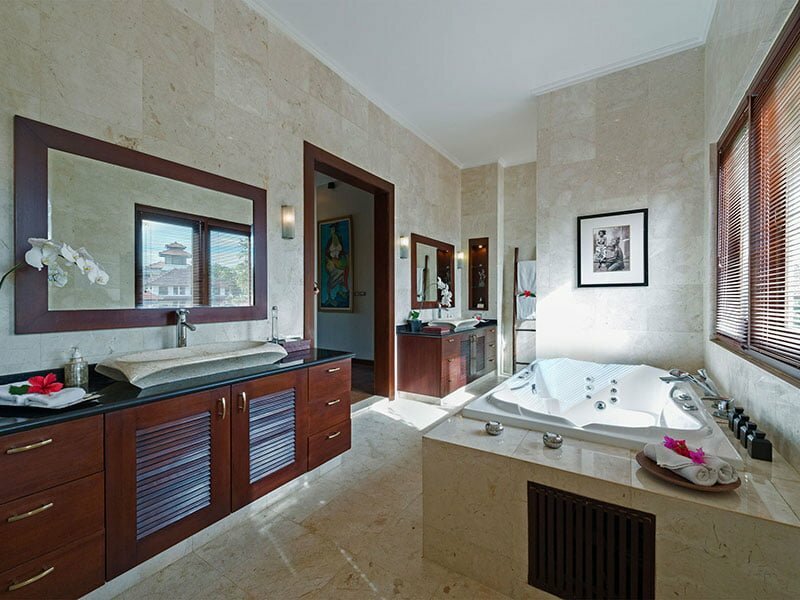 The master suite is tucked in the main pavilion on the second floor and it is tastefully decorated. 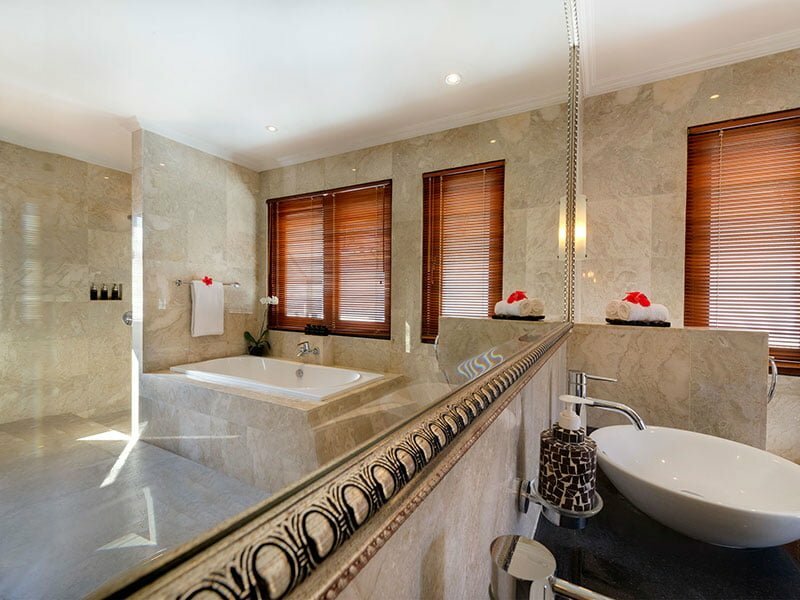 It boasts of chaise longue, canopy four-poster king-size bed, and a marble en-suite bathroom with a Jacuzzi bathtub. 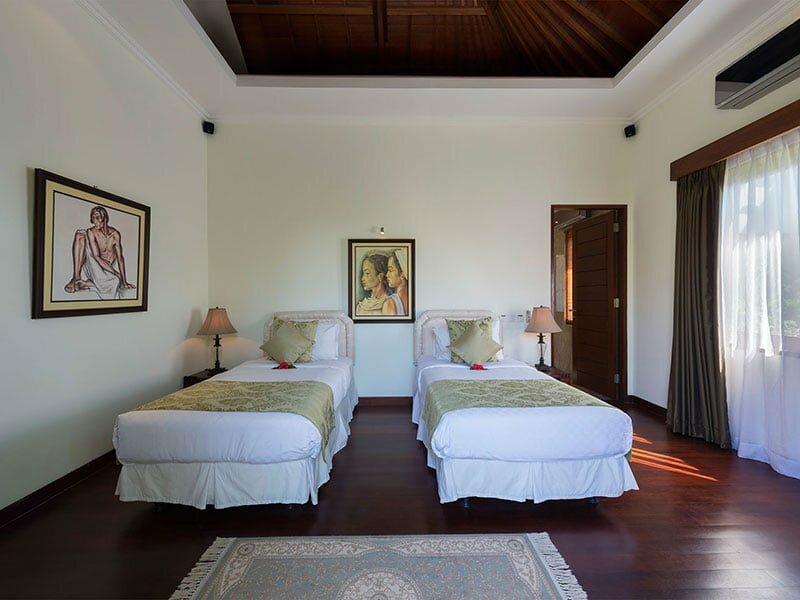 A second bedroom in the main pavilion is found on the ground floor and features a king-size bed. 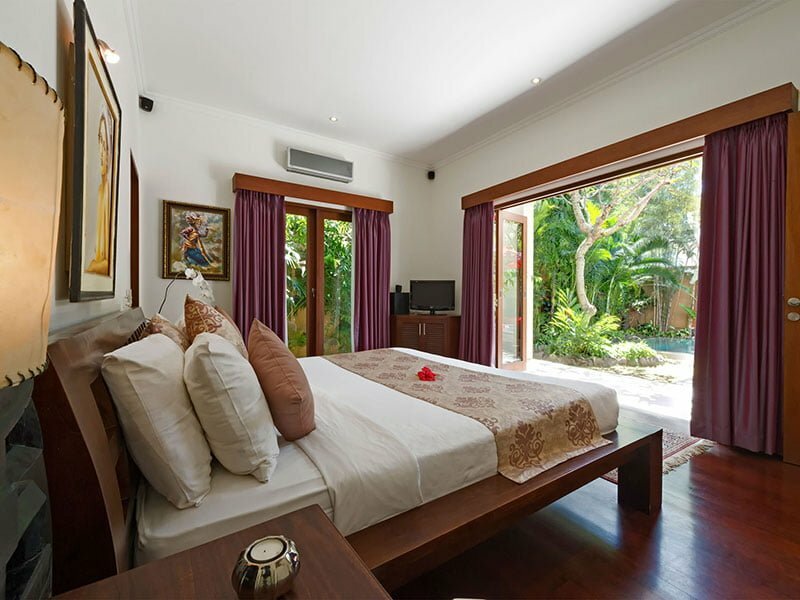 The delightfully decorated room enjoys a direct access to the garden and has an outdoor/indoor en-suite bathroom with rainfall shower and freestanding bathtub. The other three bedrooms are nestled on the guest pavilion and feature four-poster romantic king-size beds and tropical en-suite bathrooms complete with rain showers and large bathtubs. 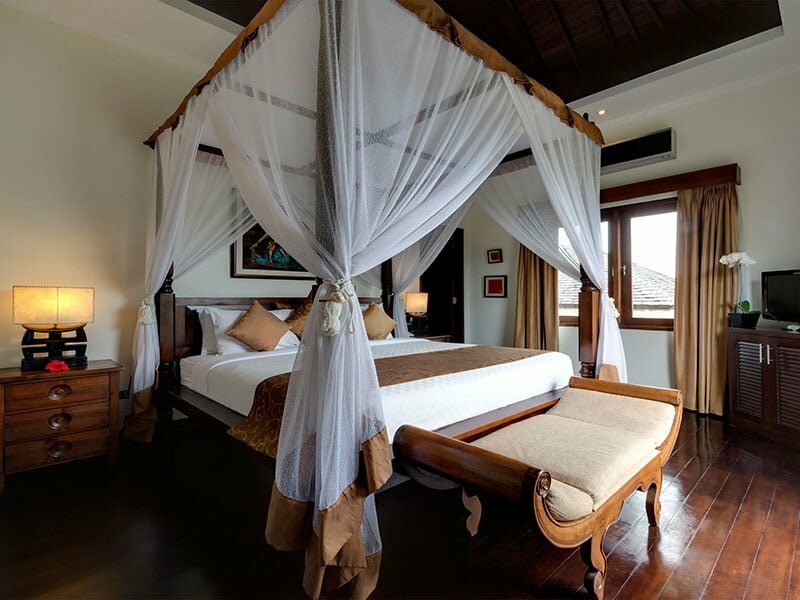 These airy and lightened bedrooms are ideal for guests looking for a private and intimate space. Our team comprises of highly a highly trained, skilled, and professional individuals who are ready to offer all guests –from a grandparent to a toddler – hospitality services that meet and surpasses their expectations and preferences. 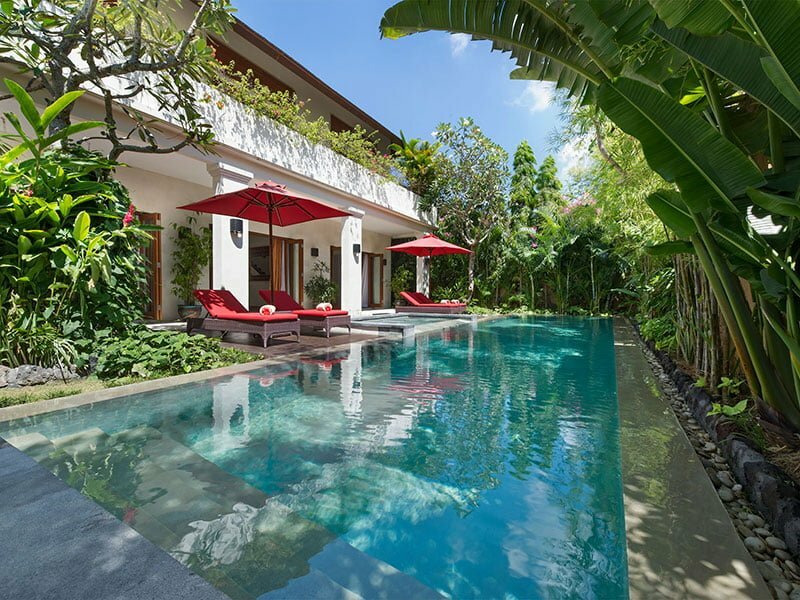 The team includes a private chef, full-time manager, housekeeper, security guard, pool attendant, and gardener. The list of service we endeavor to offer include housekeeping, spa & massage treatments, babysitting, in-house catering, free breakfast (coffee & tea), transport services, and laundry/pressing among others. 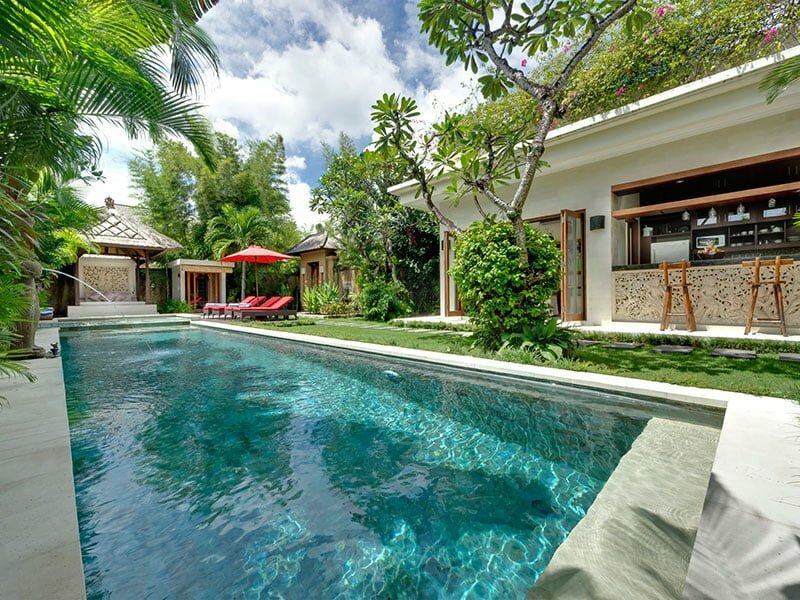 If you are looking for a stunning haven for luxury accommodation in Bali, then look no further than our villa, the Villa Kalimaya ii. 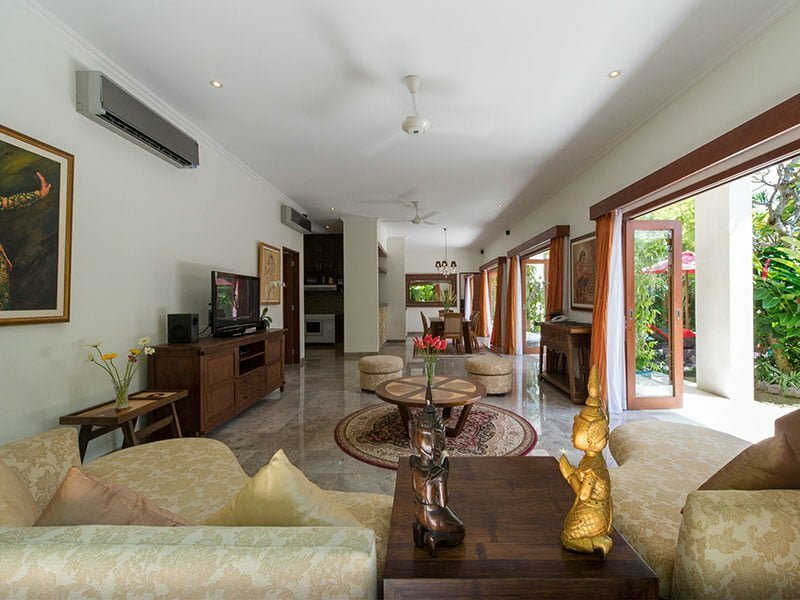 Our facility is a two-bedroom villa sitting on a two-story air-conditioned residence. 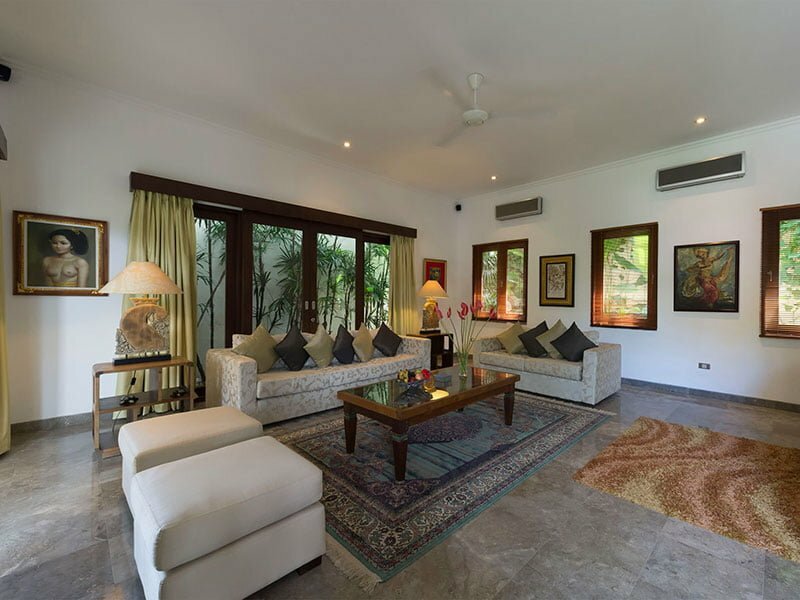 The villa is lushly furnished and features state-of-the-art amenities and facilities enough to give any guest a memorable experience. 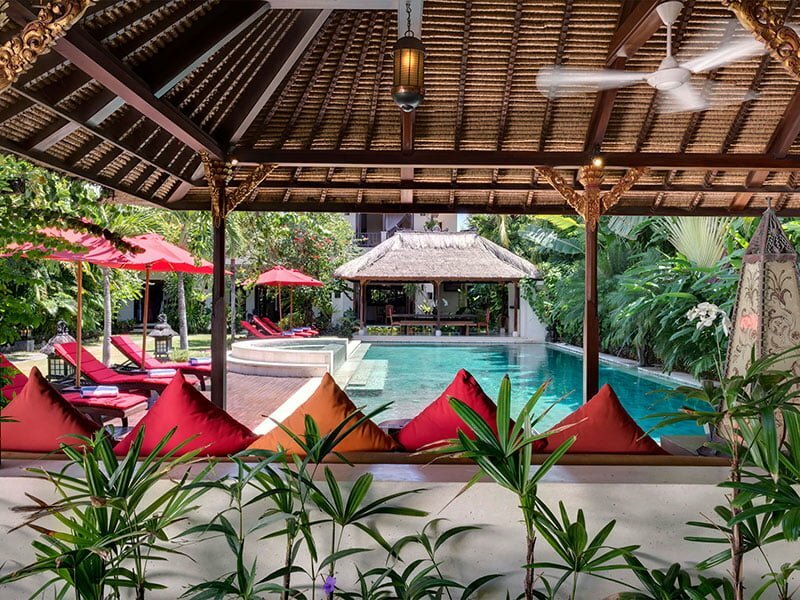 Our haven is based in the absolute heart of trending Seminyak and within a short strolling distance from some of the iconic and renowned bars and restaurants on the island. 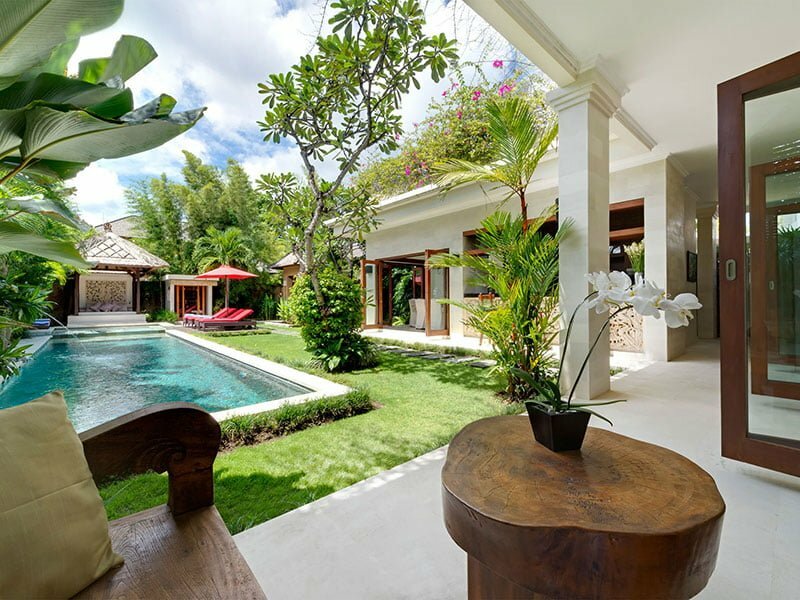 While there are many villas in the elite haven, each unit has unique and private features. 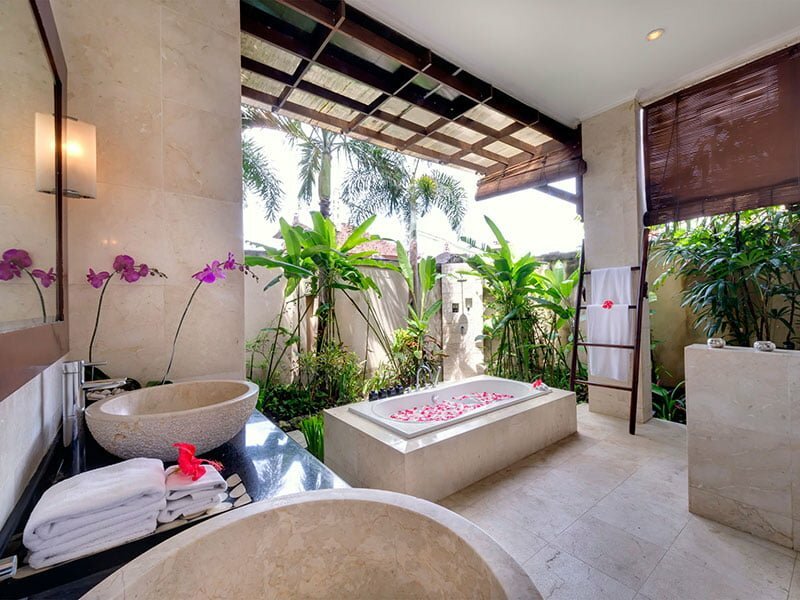 Villa Kalimaya ii is never exceptional in that respect. 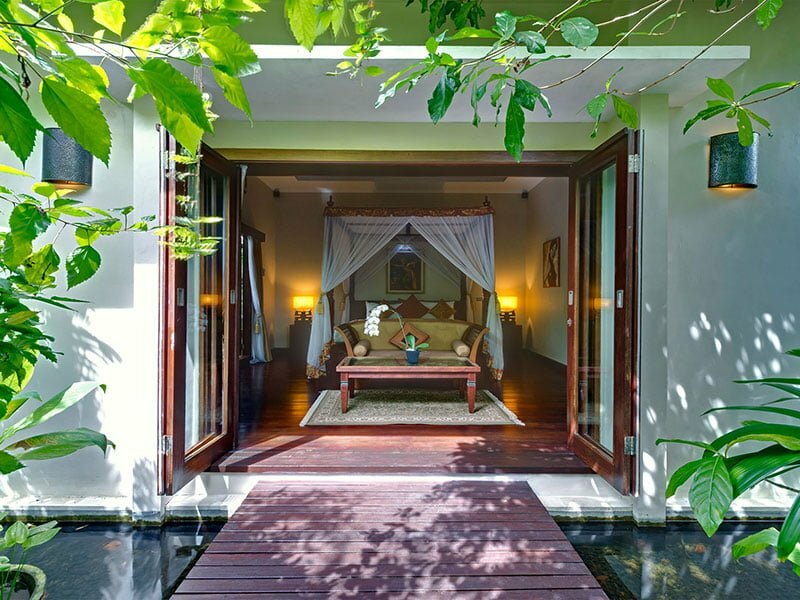 Upon entering the rustic wooden doors, you will be greeted by blossoming tropical garden walled by aromatic frangipani and palm trees. 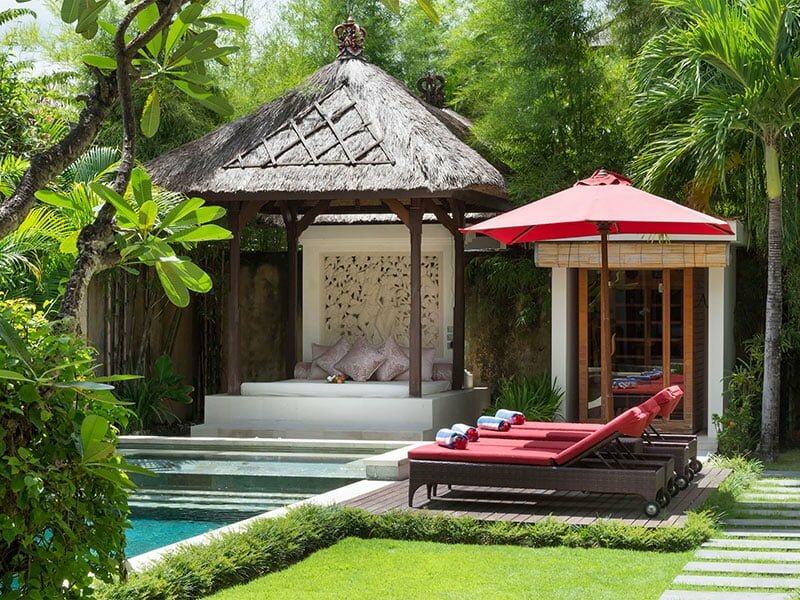 The flourishing well-kept grass lawn leads guests to the glistening infinity pool and infrared sauna. Here is the spot where most of the villa’s fun moments are recorded. The pool invites everyone to experience its dip and thereafter relax and unwind lounging comfy sunbeds spread alongside the pool deck. 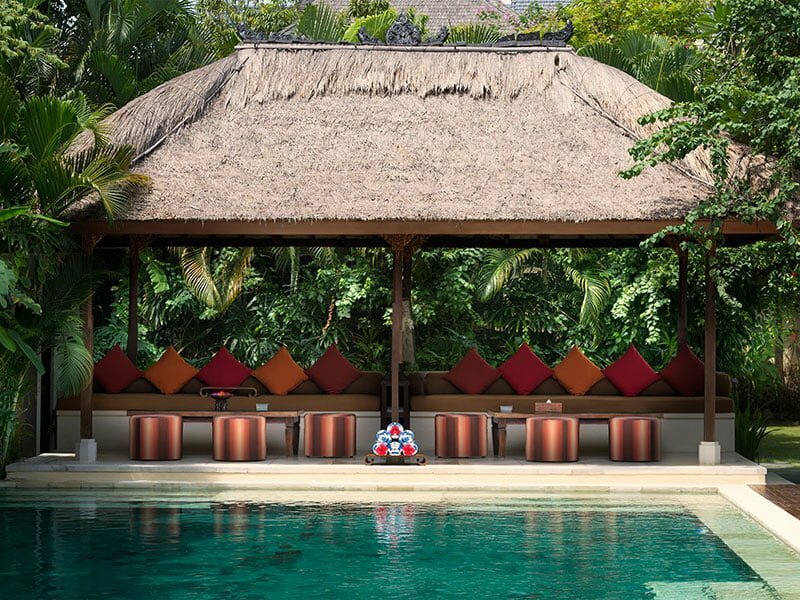 A few meters from the pool is a traditionally thatched bale that overlooks the pool and furnished with comfortable seating –an ideal place to relax and rejuvenate. 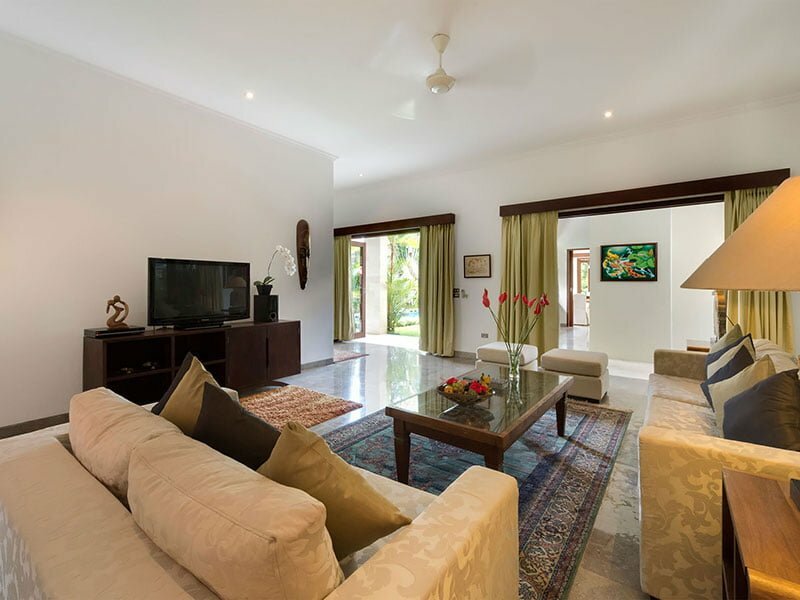 Our living areas are fantastic and include first and ground floor lounges that open up to villa’s pool and the garden. The free flow of warm tropical breeze around the soaring high roof pavilion creates an absolute air-conditioned comfort. 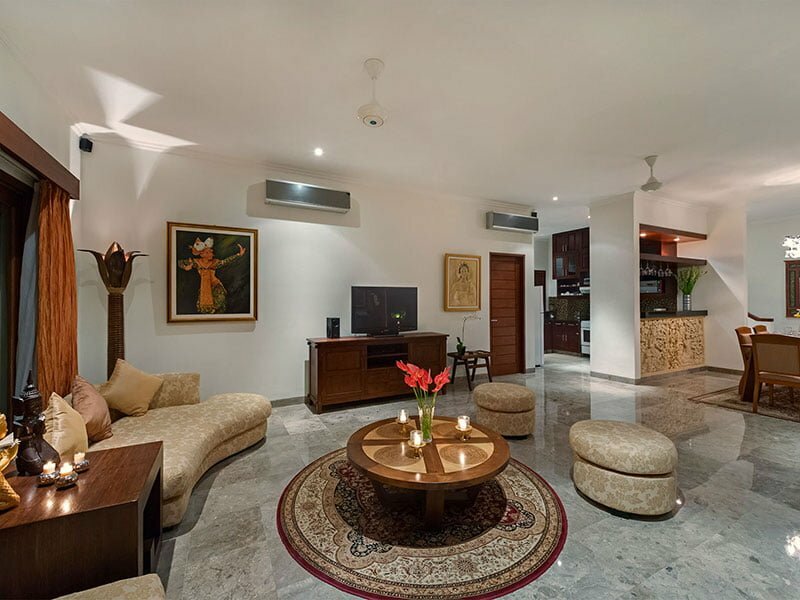 Lounges on both floors are arranged to face satellite televisions and DVD players. 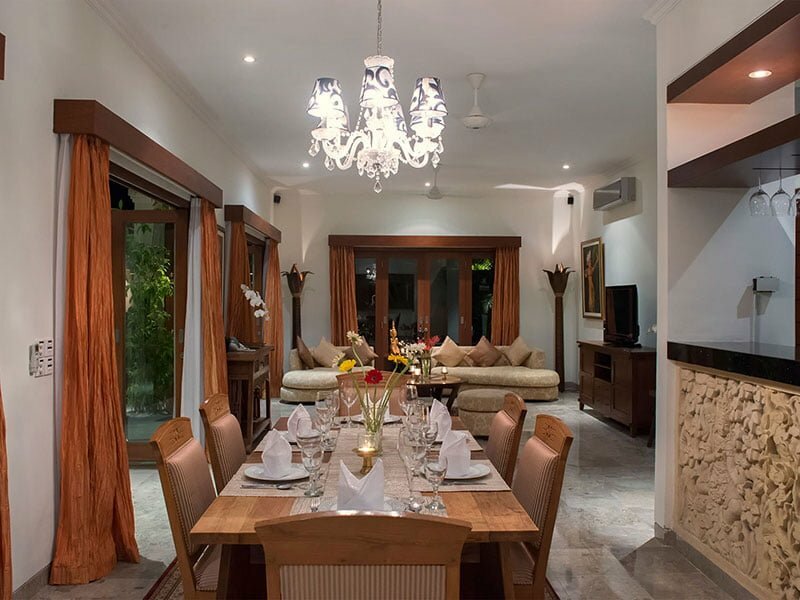 There is a dining room on the first-floor living space and overlooks the pool/garden and it is fitted with wooden dining table and seating for up to ten people. 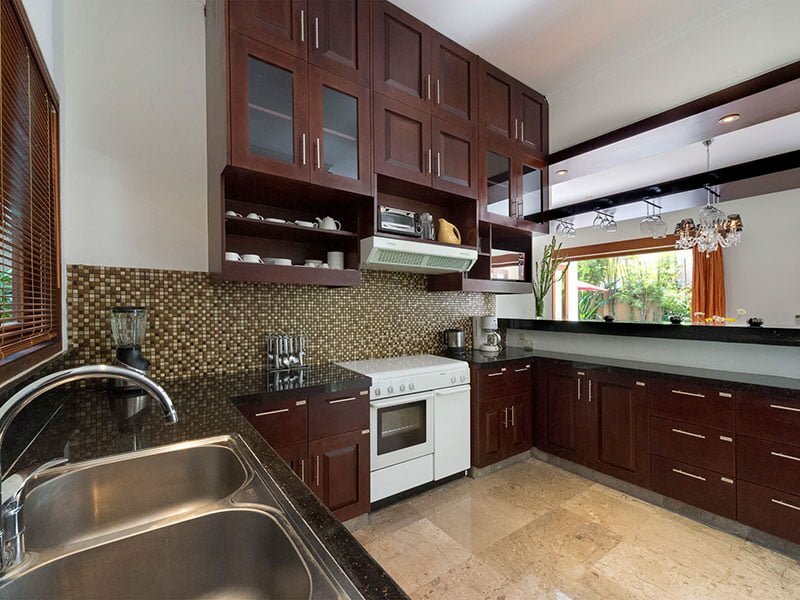 Next to the dining spot is a modern fully equipped kitchen where a private chef prepares sumptuous meals for our guests. 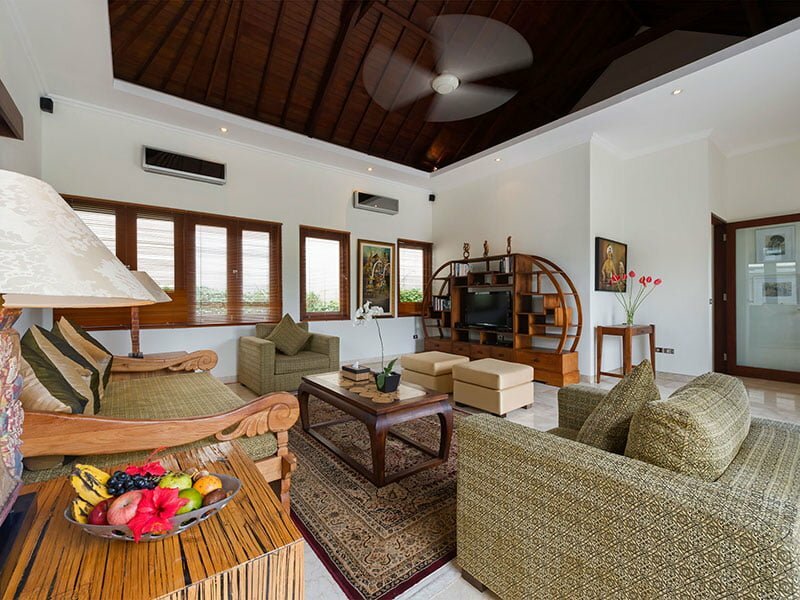 Our villa is a spacious, modern, and generous two-bedroom facility. 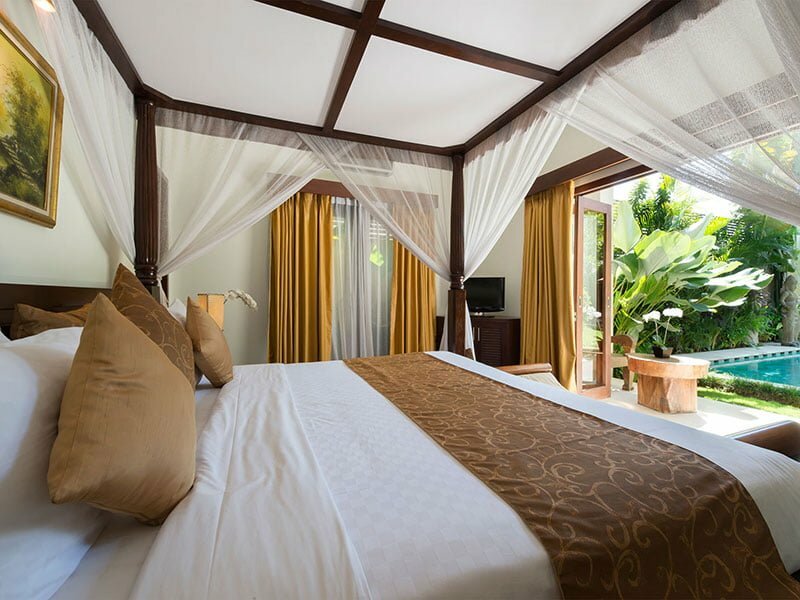 While both rooms feature luxurious canopy four-poster king-size beds, the room located downstairs boasts of large glass doors that open to the views of the pool area and tropical garden. 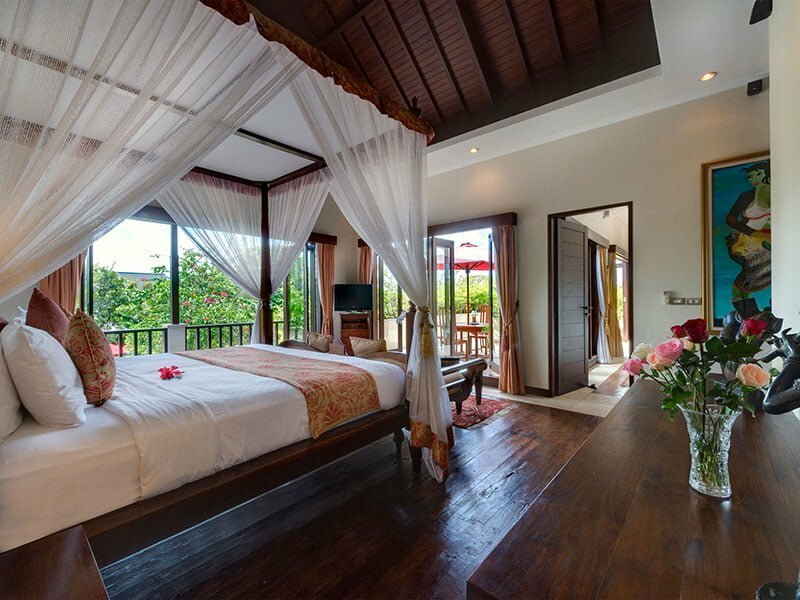 The upstairs bedroom is designed with a balcony area, giving guests a magnificent sense of space and light. 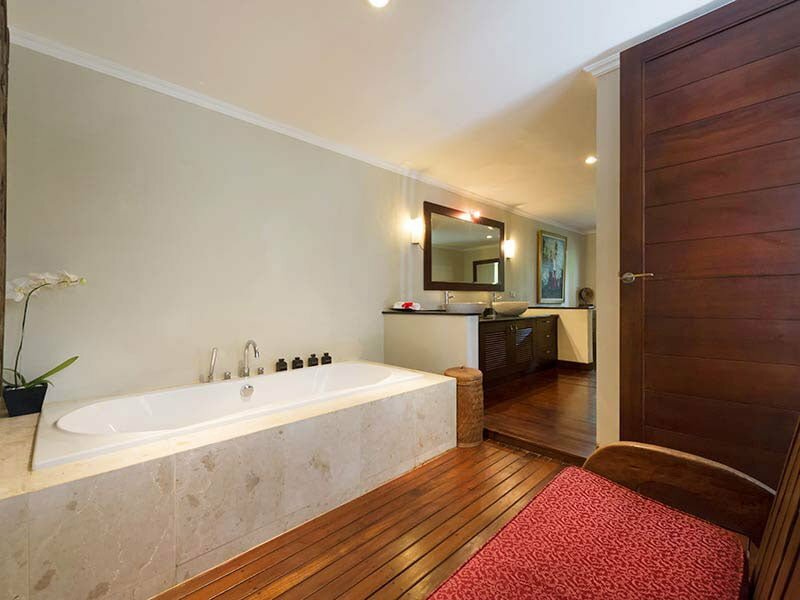 Both rooms, however, are equipped with DVD player, TV set, bar fridge, iPod dock, and an en-suite bathroom complete with rainfall shower and large bathtub. 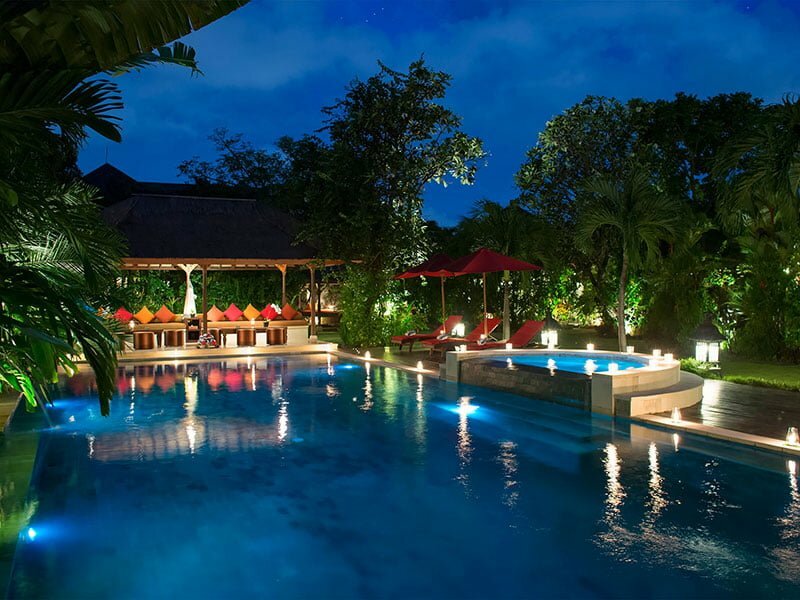 Our villa is blessed to have one of the most sought-after staff as far as their skills, competencies, and professionalism is concerned. 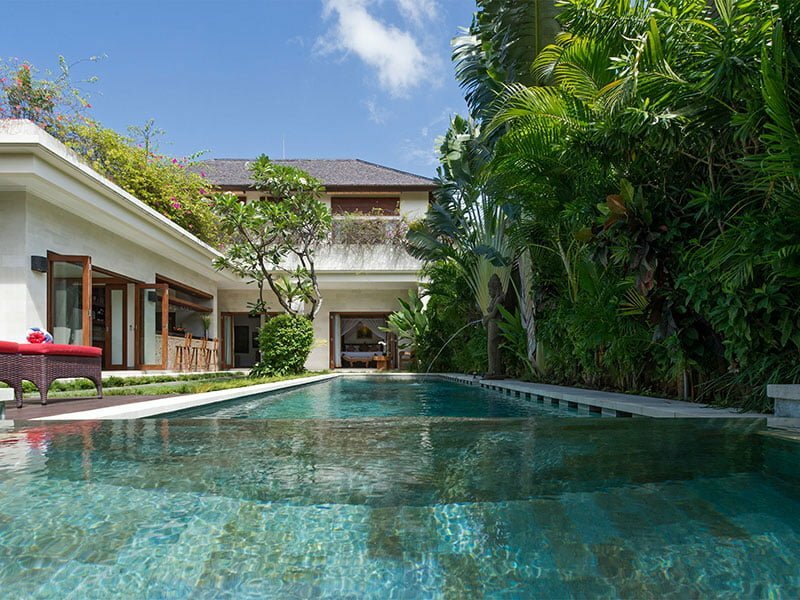 At your service are a full-time villa manager, private chef, housekeeper, butlers, security guard, and pool & garden attendant. 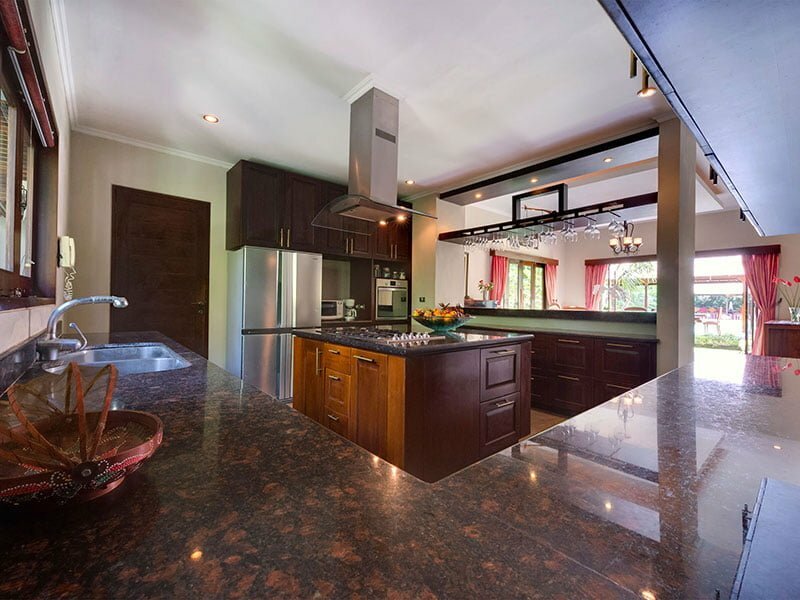 Some of the five-star services we strive to provide housekeeping, in-house catering, babysitting, spa & massage, security service, free Wi-Fi internet access, airport transfers, car/motorbike rentals, and daily breakfast –the list is endless! 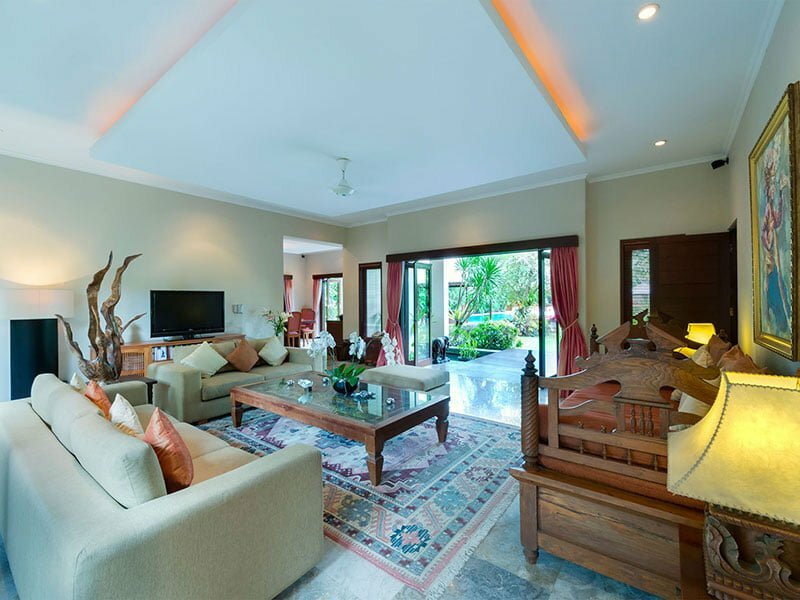 Guests looking for luxury villa accommodation are in for a great treat upon booking a space in our villa. 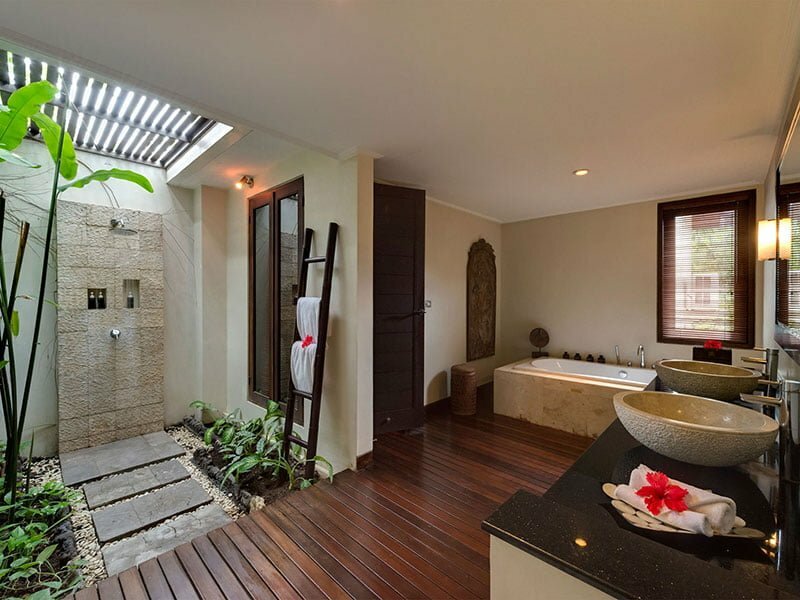 At Villa Kalimaya iii, we strive to redefine what you initially knew about villa accommodation. 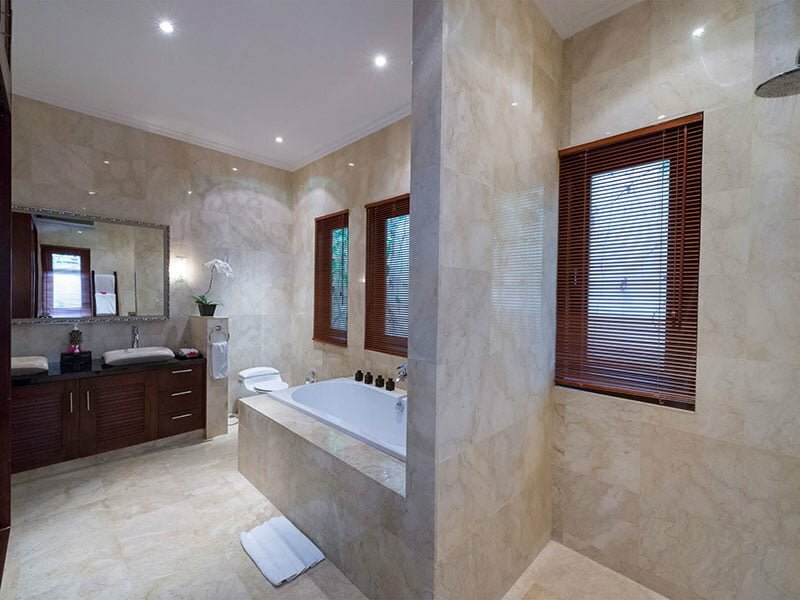 Our facility is a sumptuous three-bedroom haven with its own sense of style. 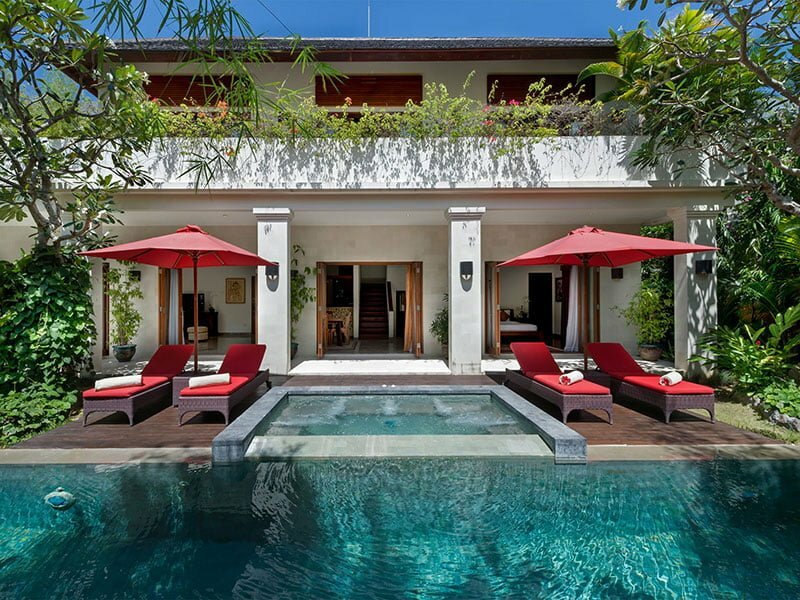 This villa is tucked in the absolute heart of bustling Seminyak and a close proximity to some of the globally known bars, boutiques, and restaurants in Bali. 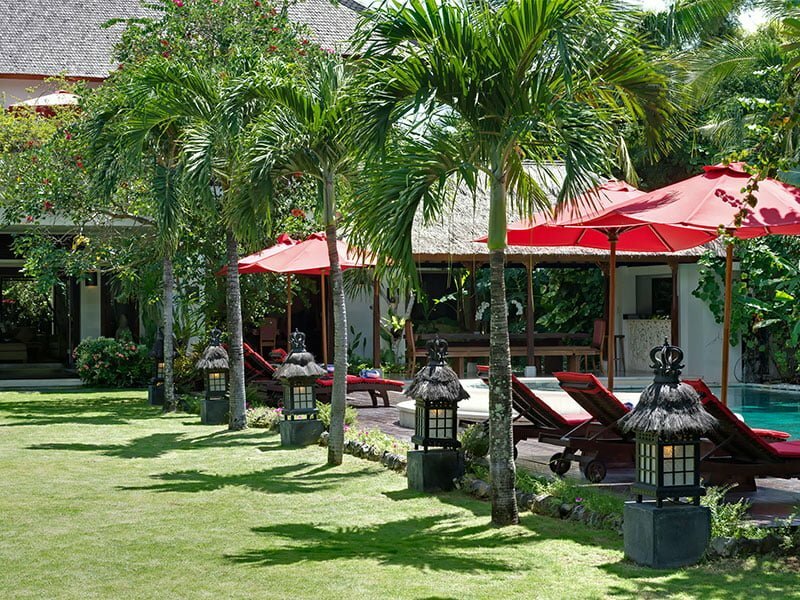 If you love surfing and other beachfront activities besides enjoying brilliant sunsets, then our villa is only a few minutes from Pura Petitenget beach. 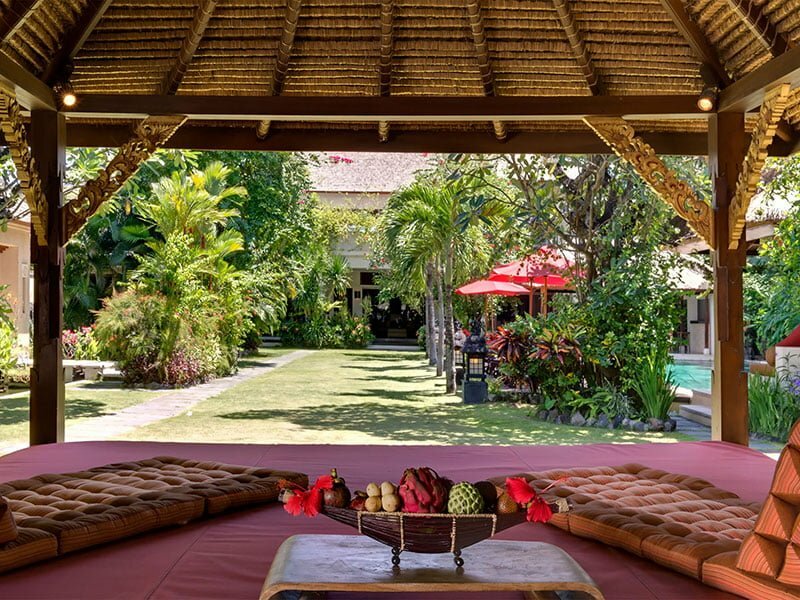 Upon entering the wooden gates of Villa Kalimaya iii, you will be transported into a tropical garden glistening with aromatic frangipani and coconut palm trees that advances a tropical vibe. Inside the well-kept grass lawn is a massive swimming pool that invites everyone to experience a whole-day immersion. 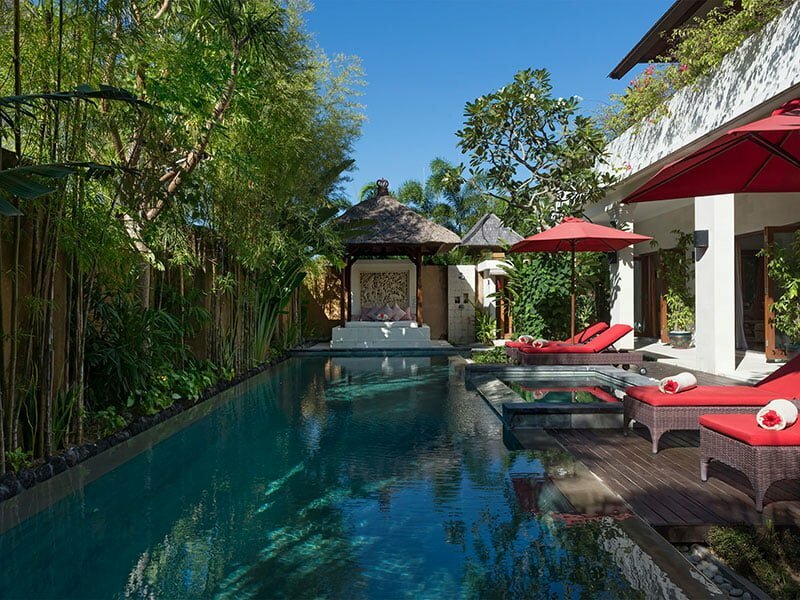 Alongside the pool deck are comfortable lounge chairs and umbrellas –a centerpiece for enjoying Balinese massages or soaking up under the sun. 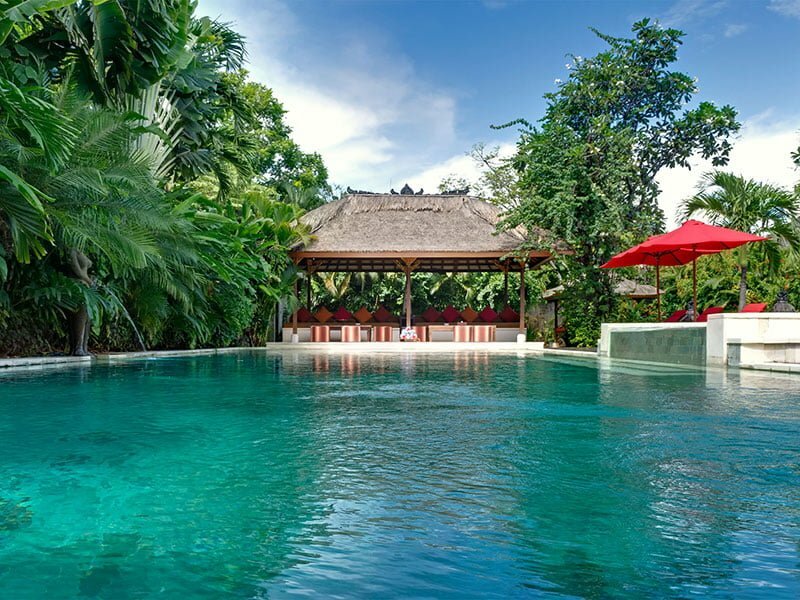 There is also a bale at one edge of the pool for guest to relax and rejuvenate while keeping an eye on their kids as they play in the swimming pool. 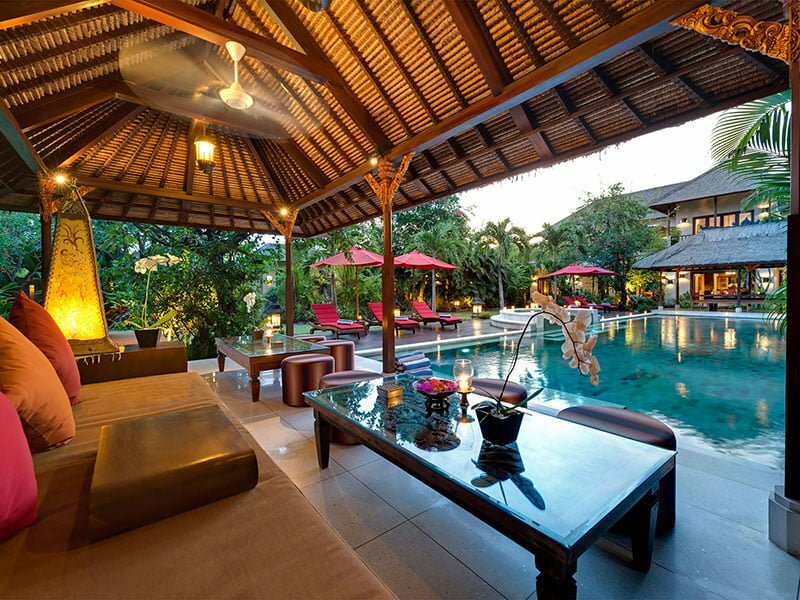 Our Villa Kalimaya iii is well-known for its spacious, large, and comfortable living space. It advances an open-plan concept so guests can enjoy wonderful views of the pool and garden area beside breathing in warm tropical breezes. The air-conditioned pavilion is enclosed for comfort and maximum entertainment through a flat-screen satellite channel television, DVD player, and Bose surrounds sound system. The L-shaped sofas and coffee tables face these entertainment set! 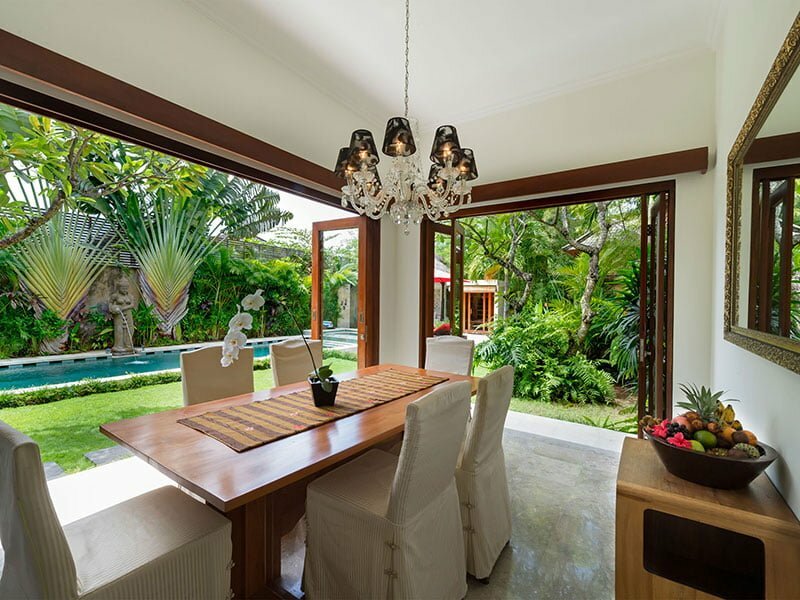 Inside the living space is a modern dining room that overlooks the villa’s pool and the garden. Next to the dining room is a fully furnished kitchen area fitted with modern amenities and facilities for sumptuous meal preparation. 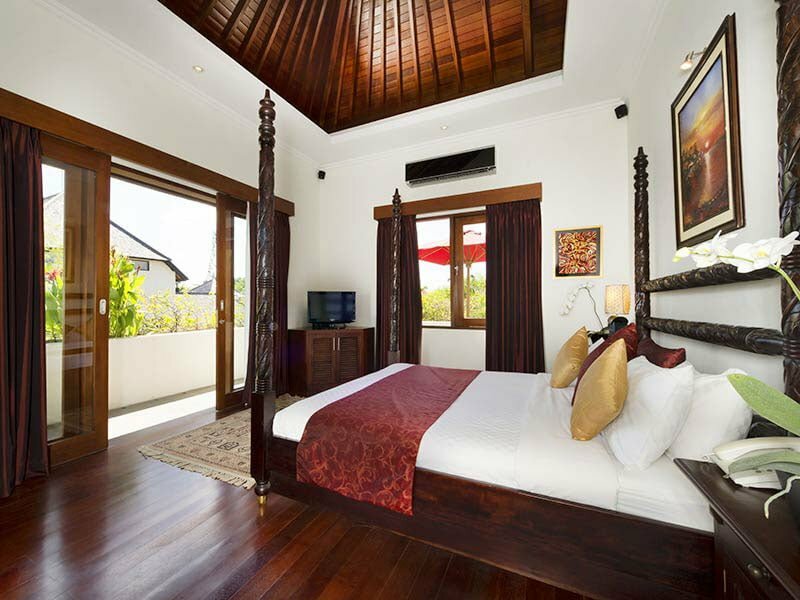 Our villa’s highlighting feature is the three beautiful air-conditioned bedrooms. 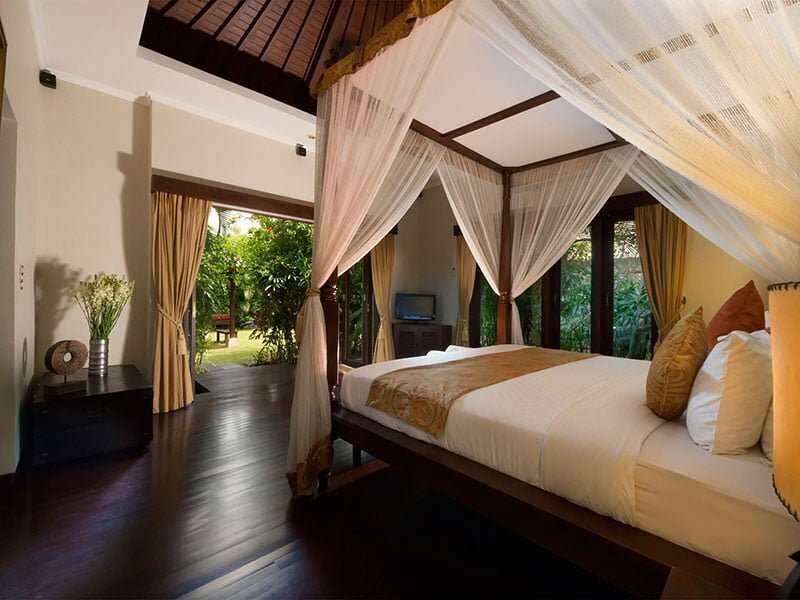 They all feature luxurious canopy four-poster beds. 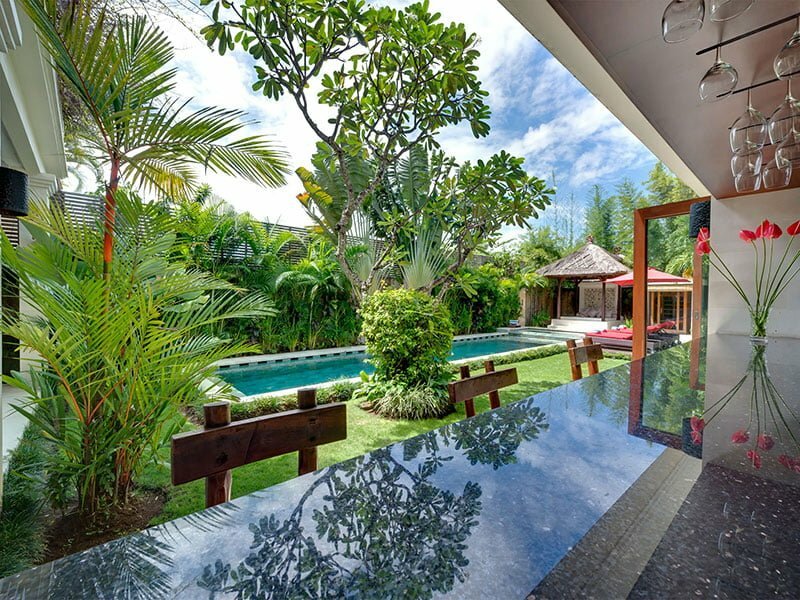 One of the rooms is located downstairs and boasts of full-length sliding glass doors that open up to villa’s garden and pool area. 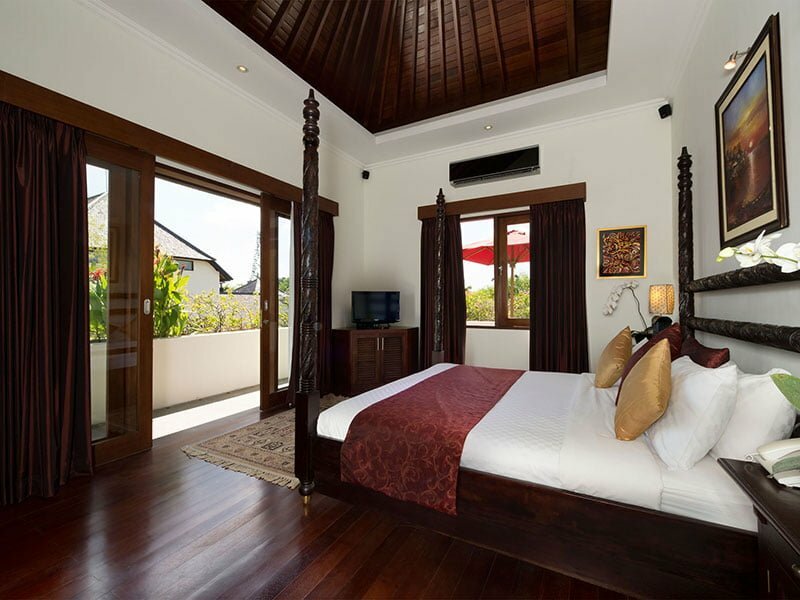 The rest of the bedrooms are tucked upstairs and features a terrace that gives guests a stunning sense of space and light. 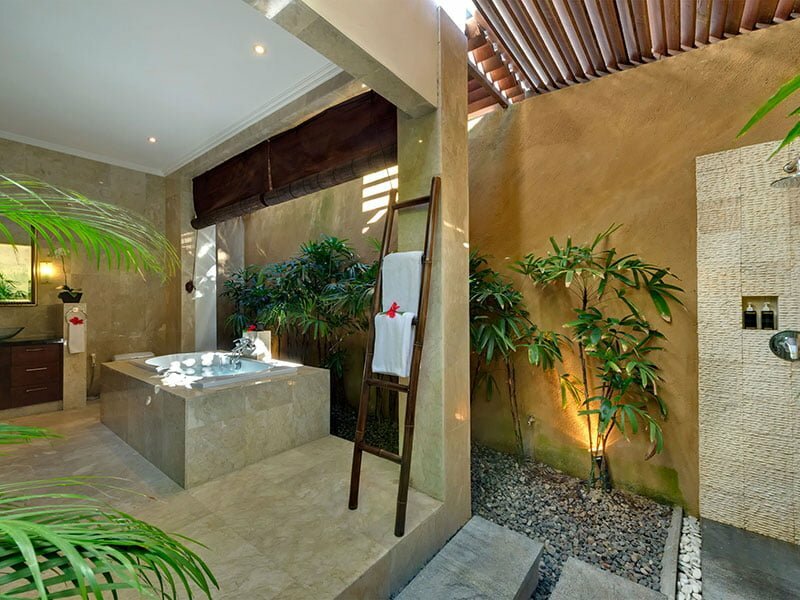 All the bedrooms, however, are furnished with a DVD player, television set, and marble-floor en-suite bathroom complete with rainfall showers and large bathtubs. 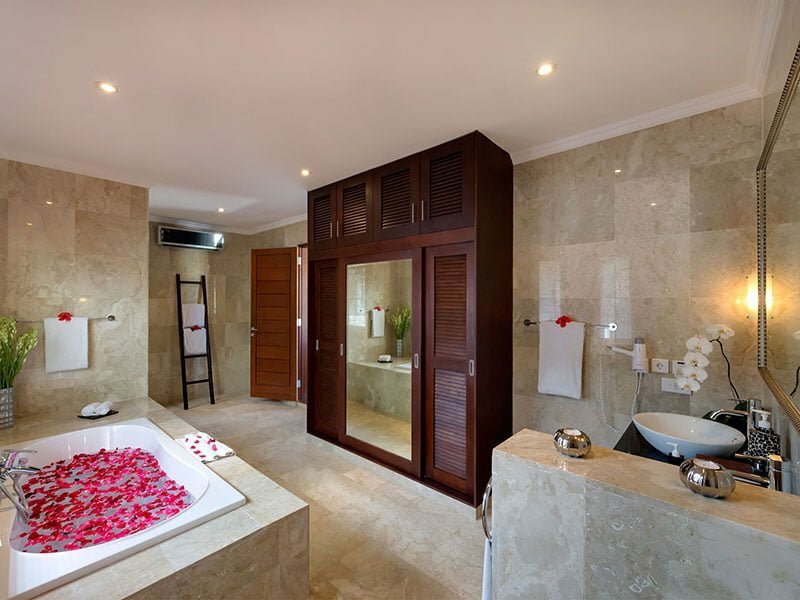 One of the greatest merits of staying at our villa is that you will enjoy personalized services provided by a team of a highly trained, professional, welcoming, and friendly staff. 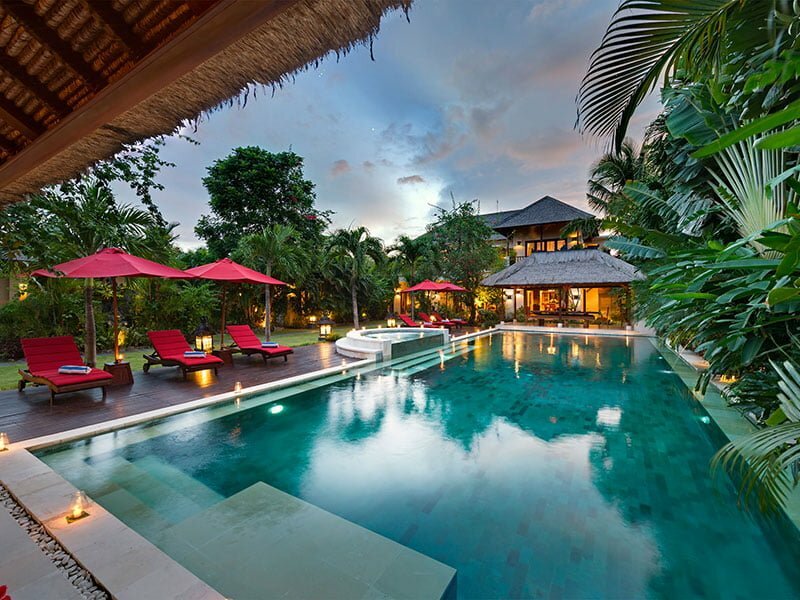 The team here includes a full-time chef, villa manager, butler, housekeeper, security guard, and pool/garden attendant. Some of the services we endeavor to offer include housekeeping, in-house catering, full-time security, babysitting, daily breakfast, complimentary tea/coffee, and spa/massage services. Any other service not mentioned here may be offered upon request. 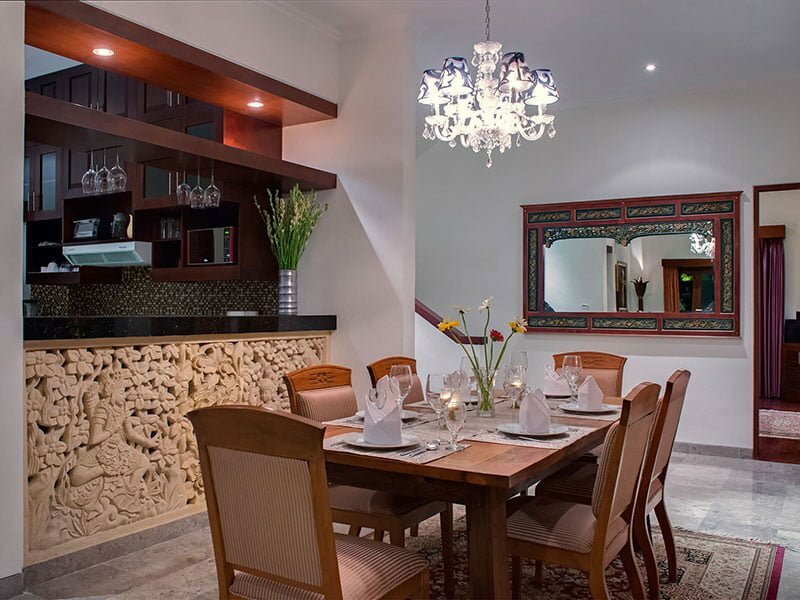 If you are looking for a good villa to treat your loved ones with a memorable accommodation experience, then settle no less than our villa, the Villa Kalimaya iv. 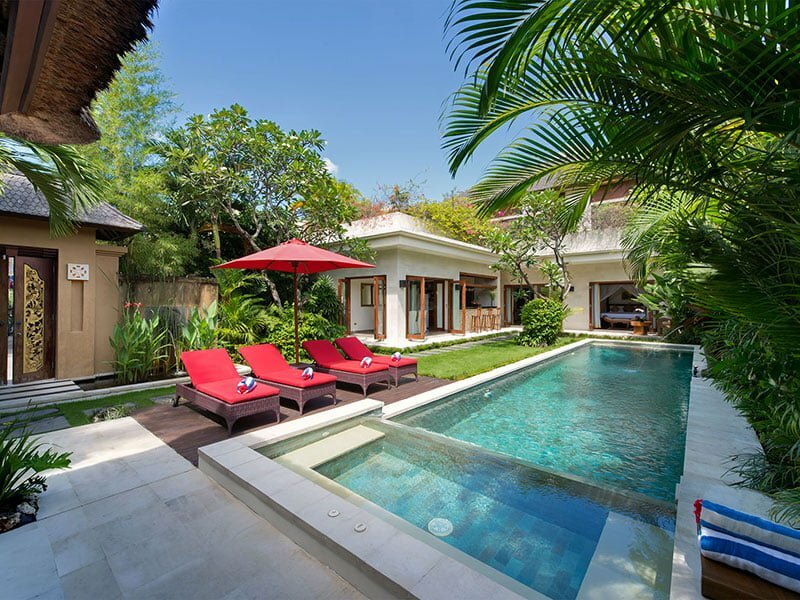 Our facility is fully staffed and stylish luxury villa set in a calm and quiet garden featuring two bedrooms with modern facilities/amenities. 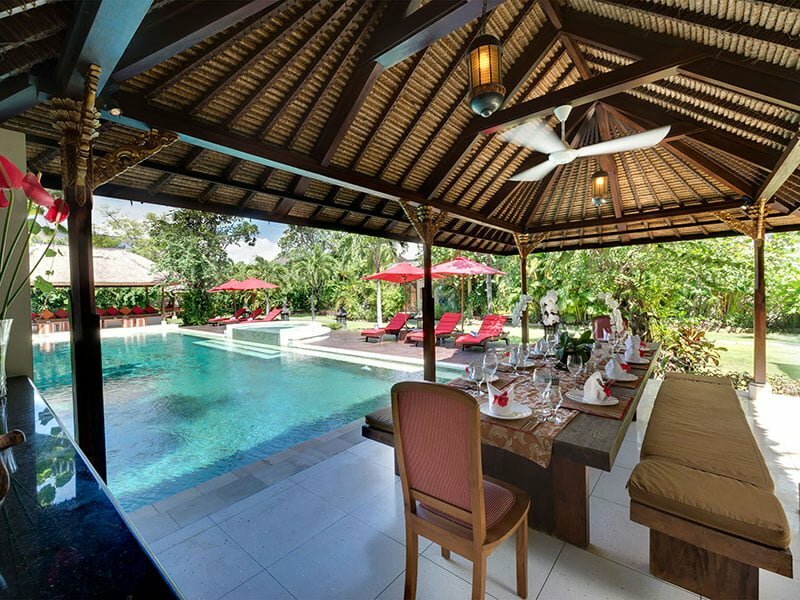 With two living pavilions, dining room, an open-plan kitchenette, terrace, jacuzzi, infrared sauna, and private swimming pool, our villa will sure provide with all you need to have an unforgettable holiday and accommodation experience. We are tucked in the heart of trending and vibrant Seminyak. 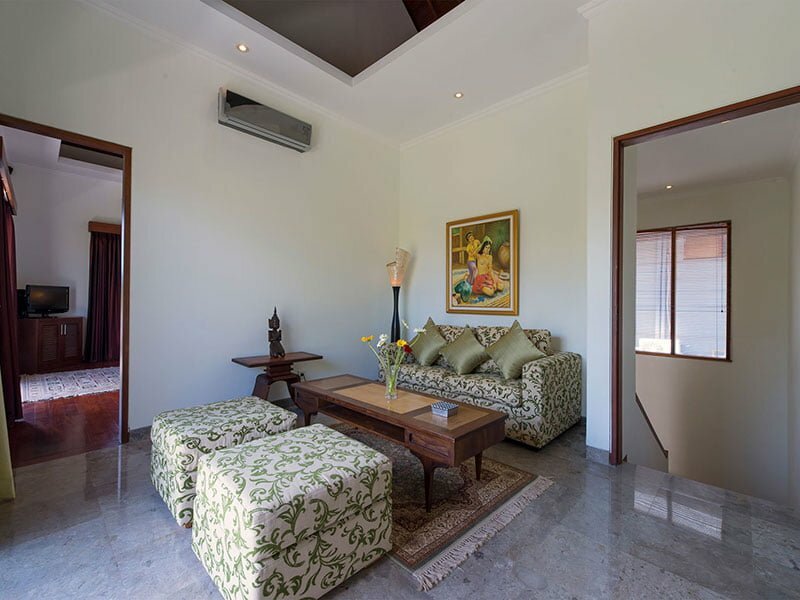 Our Villa Kalimaya iv is an excellent option for families and group of friends as there are plenty of outdoor spaces for them to relax, sit back, and chill out. 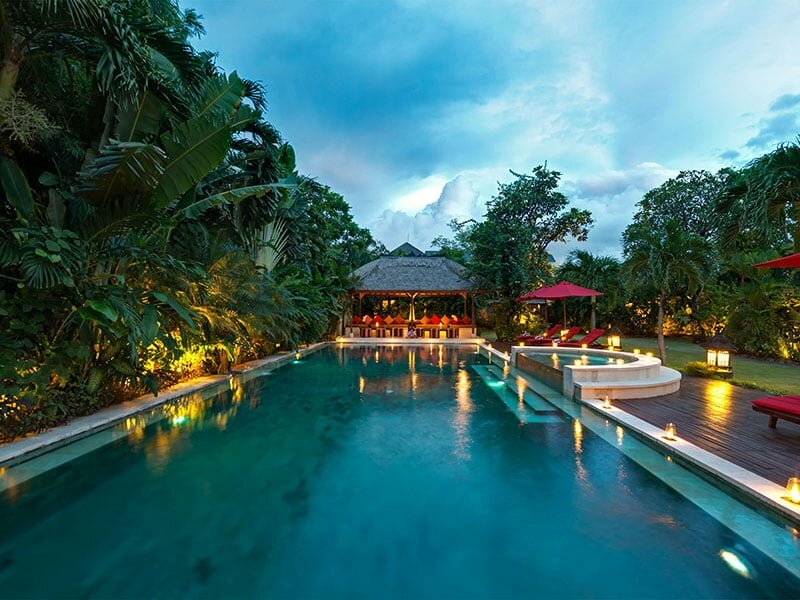 The villa sits on a lush tropical garden with foliage made up of coconut palm trees, frangipani trees, and flowering plants. 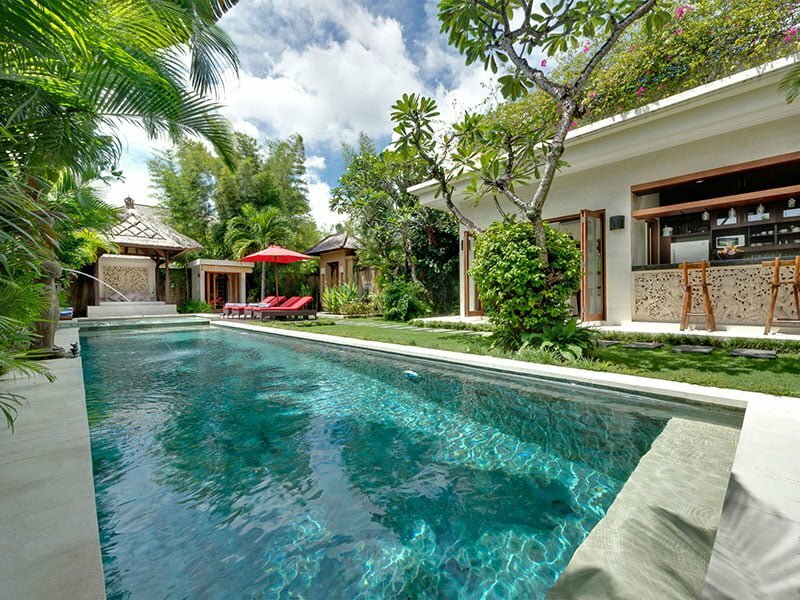 Much of the villa’s fun takes place at our private swimming pool area. This 12 by 4 pool invites everyone any time to have a dip of its waters. 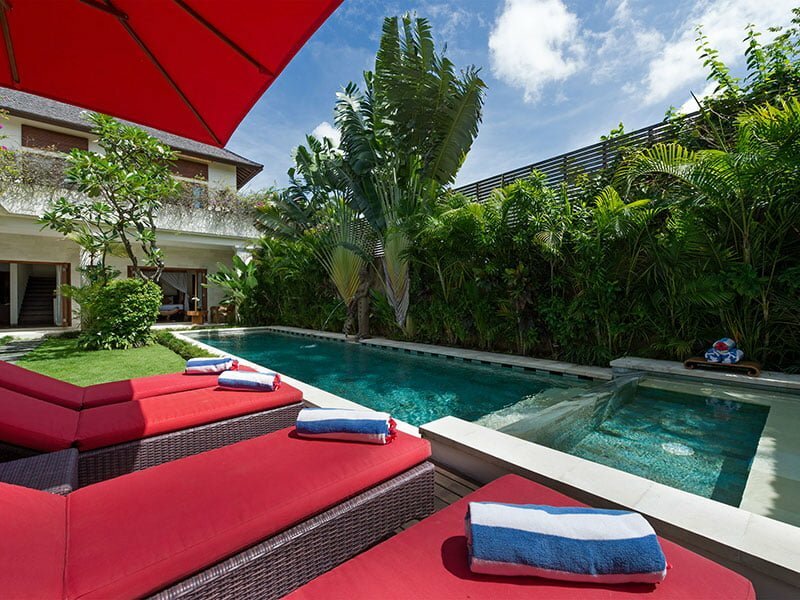 If exhausted, you can always relax as you soak up under the sun while lying on the comfy reclining loungers placed alongside the pool. 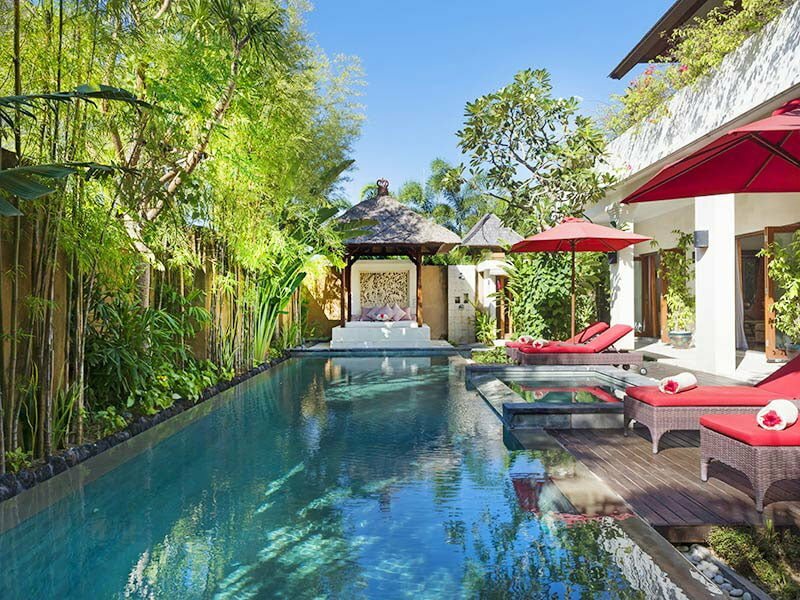 Our charming villa sits on a two-story building, each boasting of two living pavilions –one down and one up –but with similar features. 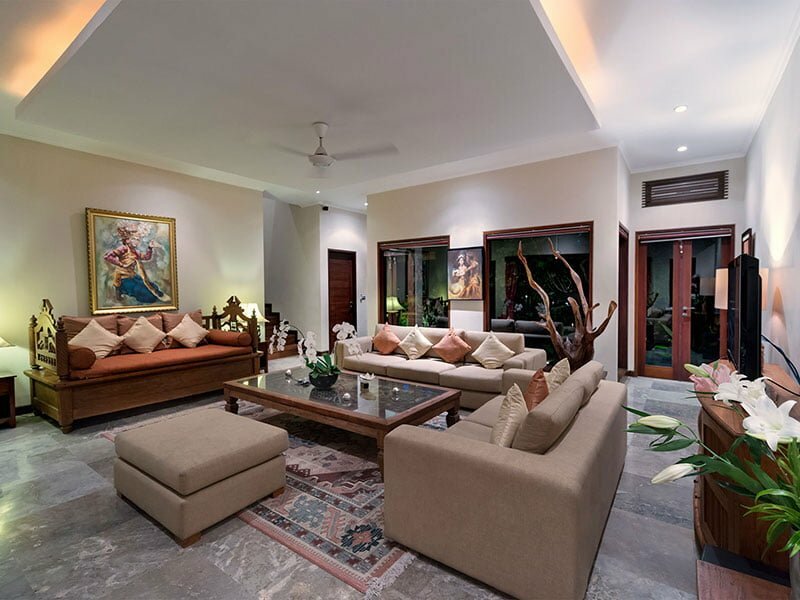 Both living pavilions are furnished with L-shaped sofas and small coffee tables arranged to face DVD players, satellite channel television, and Bose sound systems to complete the entertainment vibe. Inside the living space, at the rear section, is a dining area with a large wooden dining table with seating for up to six people. This spot overlooks the pool area and the villa’s garden. 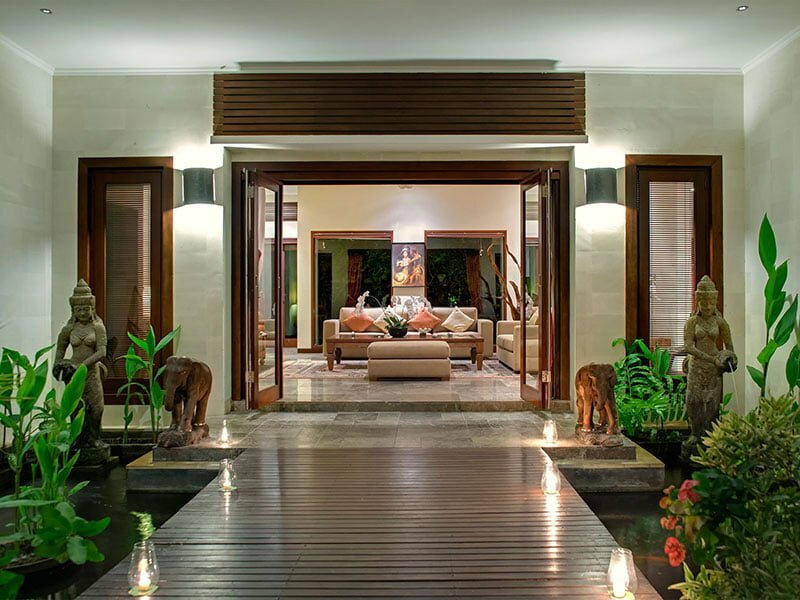 Villa Kalimaya iv is a spacious and generous three-bedroom facility with full-length glass windows/doors that can be opened to create a sense of airiness and space. 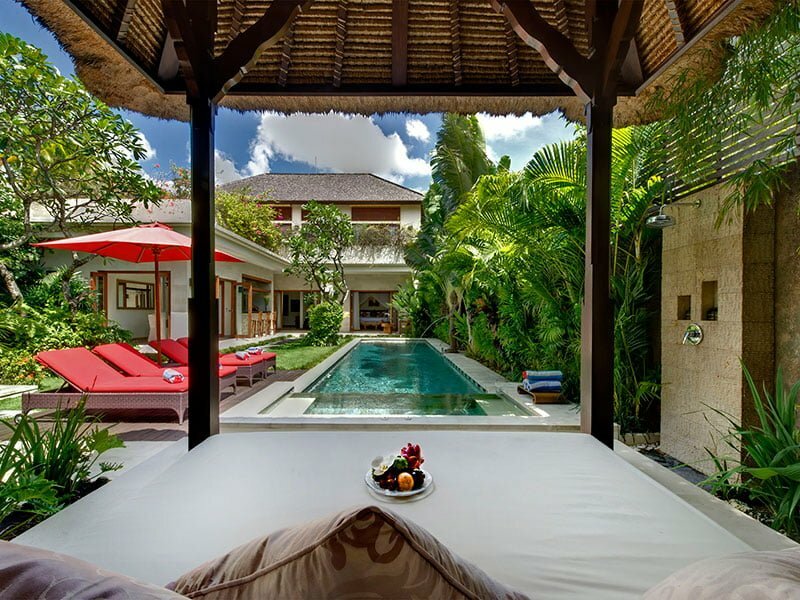 One of the bedrooms is located downstairs and its doors open up to the villa’s garden and the pool. It is furnished with a king-size bed. The remaining bedrooms are tucked upstairs and feature convertible twin bed. 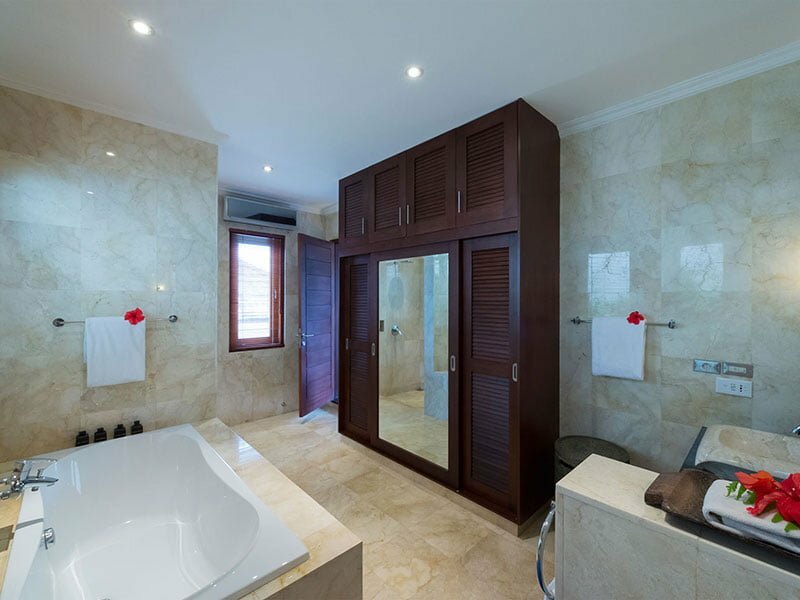 Both rooms, however, boasts of an air-conditioning system, bar fridge, DVD player, TV, and plush marble-floor en-suite bathroom with bathtub and rainfall shower. 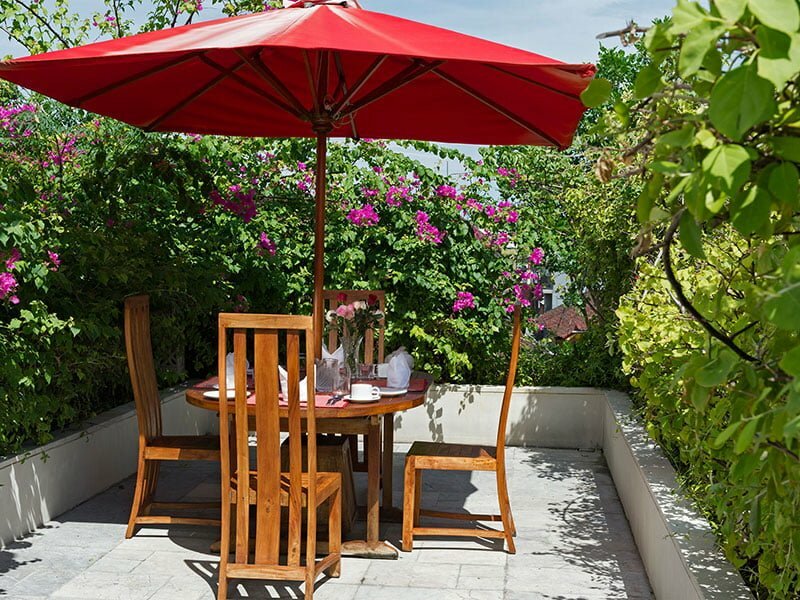 One of the reasons why you will love our villa is that our staff are highly trained, professional, welcoming, and friendly, a virtue that ensure you have had one of the best stays. At your service are a full-time manager, butler, housekeeper, security guard, pool/garden attendant, and a full-time chef. Some of the services we strive to offer include housekeeping, airport transfers, in-house catering, babysitting, daily breakfast, and spa/massage treatment –the list is just endless!